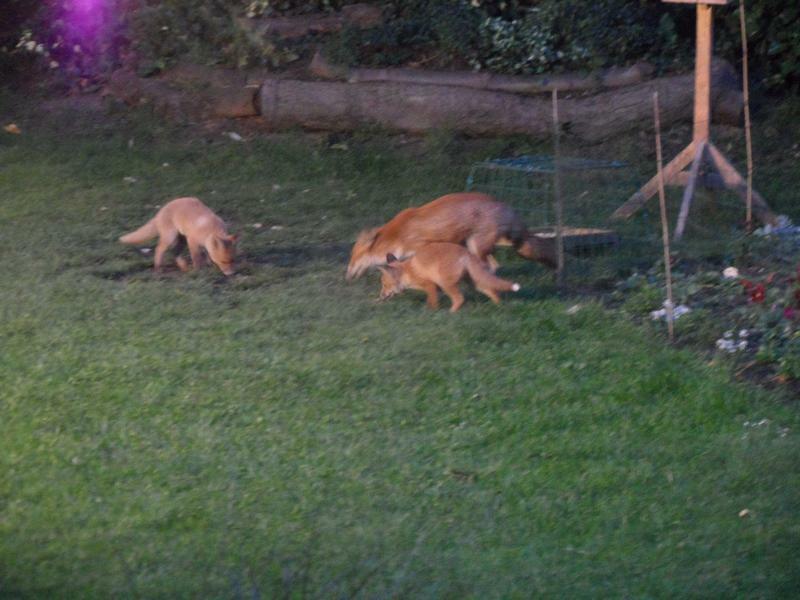 into the garden each night with their mother and sometimes grandmother. away before he manages to catch any fish. 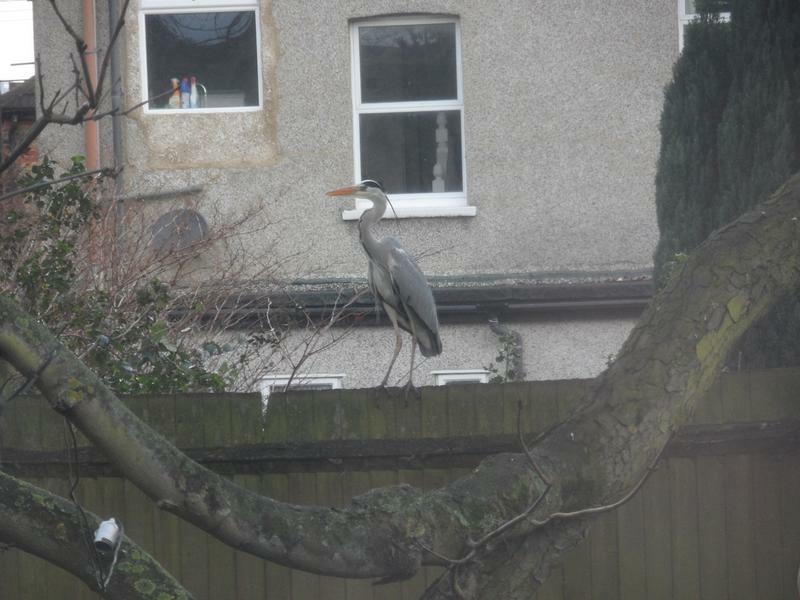 Often the crows are helpful trying to disturb the heron. 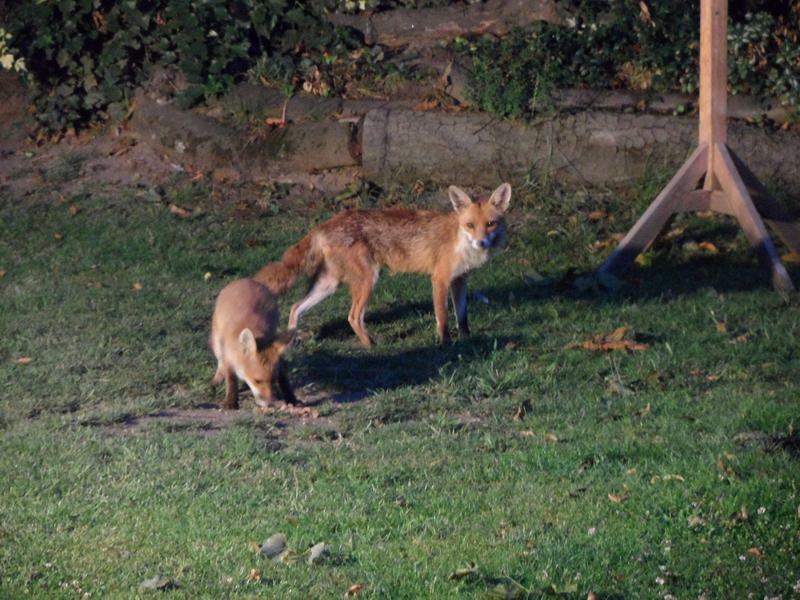 spots later in the summer. 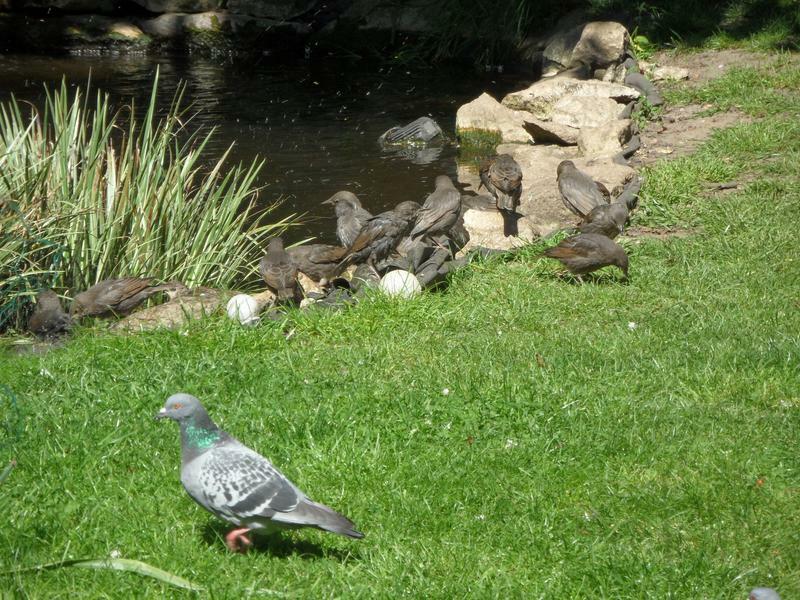 Unfortunately, they drop a lot of the bread as they learn to feed, so there are also a lot of pigeons here. 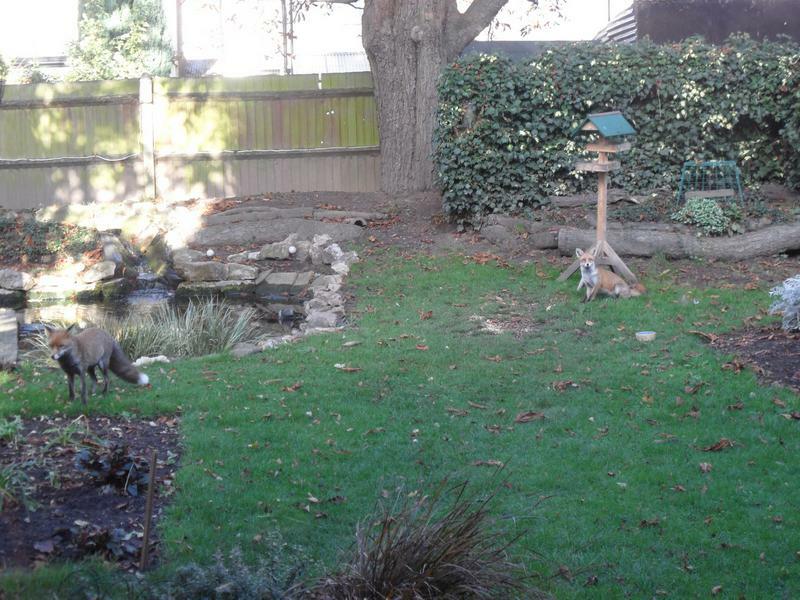 Several fledgling Starlings paddling and drinking from the pond. 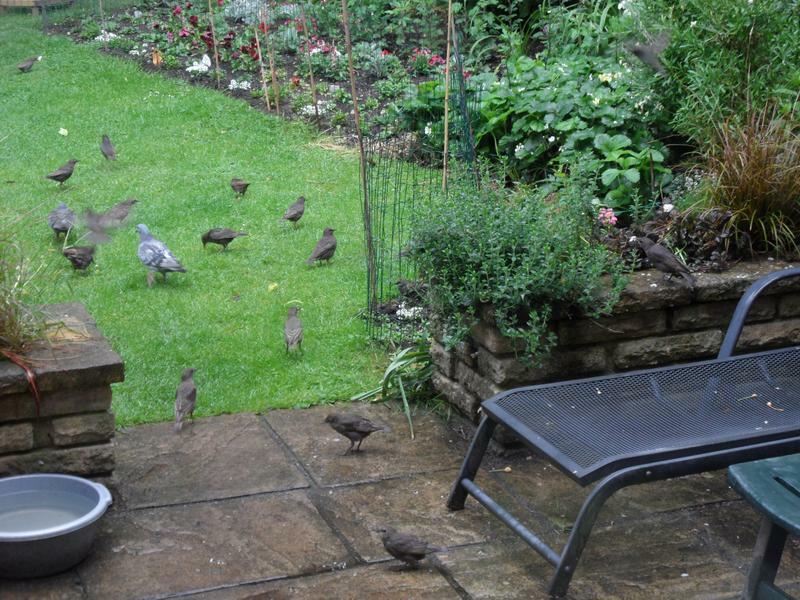 Yet more fledgling Starlings on the lawn, trying to eat their bread, but the pigeons try and steal it. 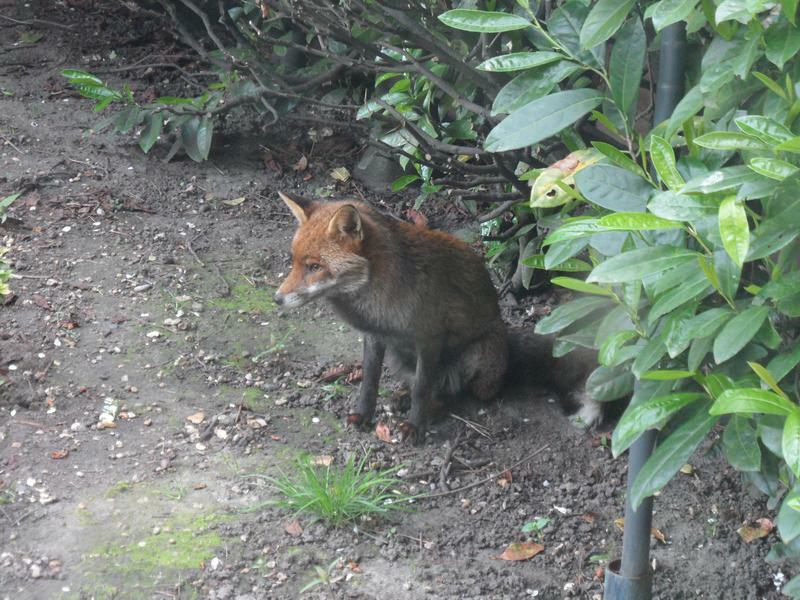 fox since December, he was one of the cubs born nearby 18 months ago, but has maybe moved to a new territory now. 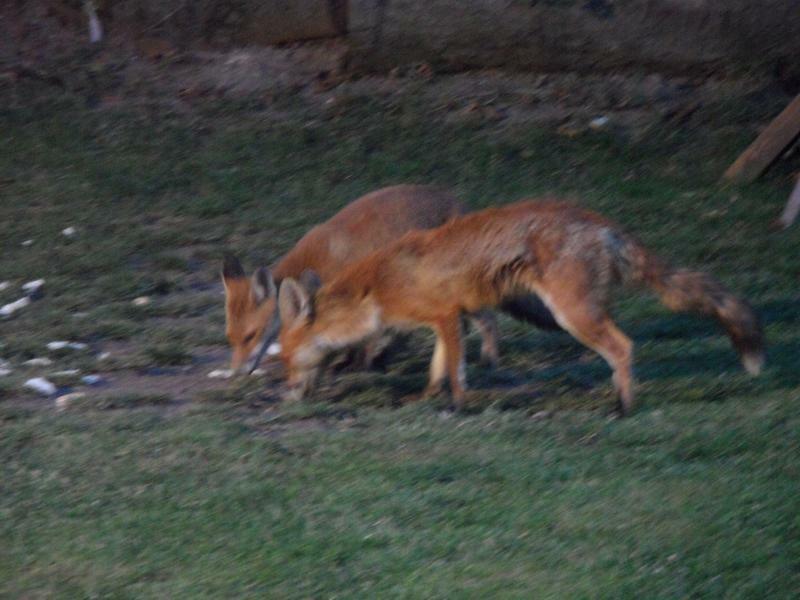 White tailed is often here twice a day, at dusk for more food. 2012. 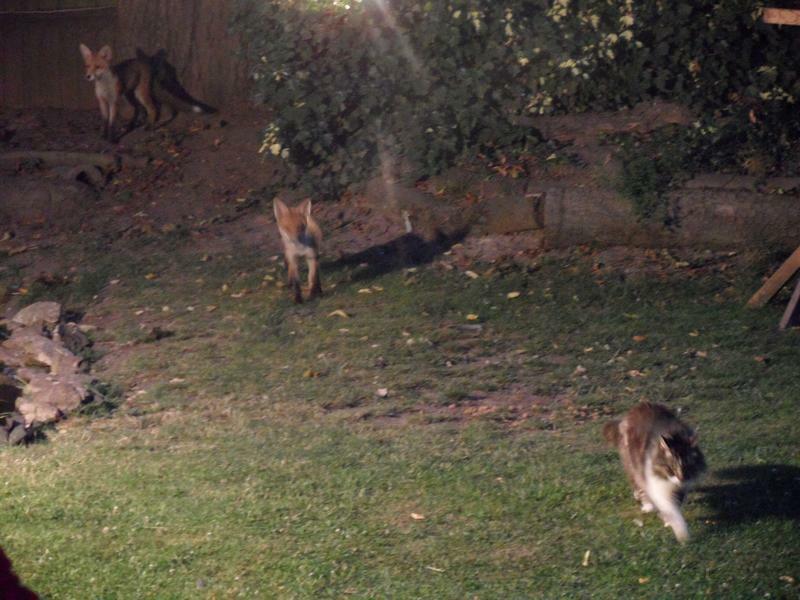 Three months later she brings cubs into the garden, they were probably born around now but did not leave their den for weeks. 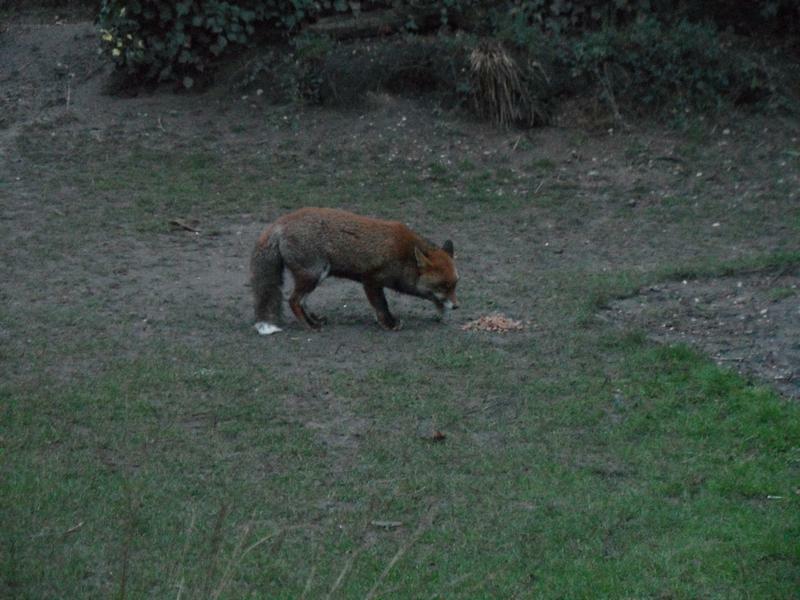 Evening meal of dog biscuits for white tailed fox. 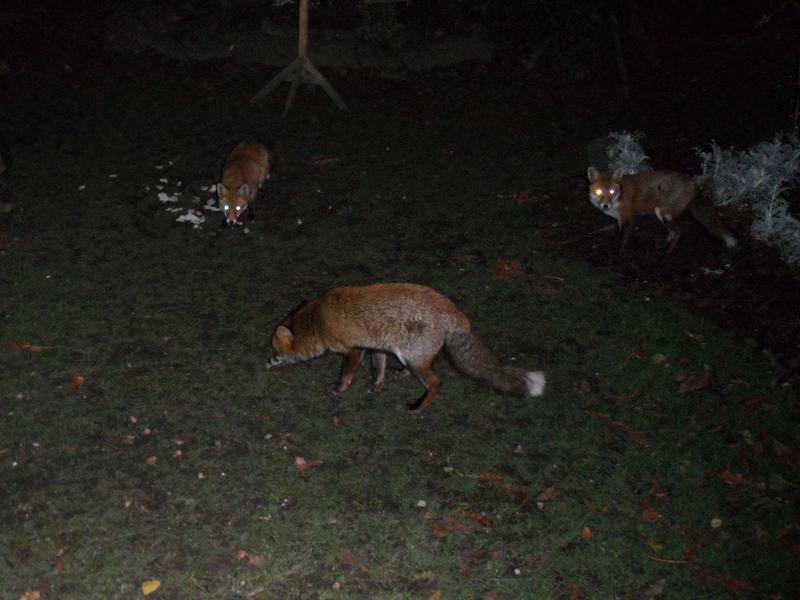 White shirt fox only seems to eat in the evening, never in the morning. 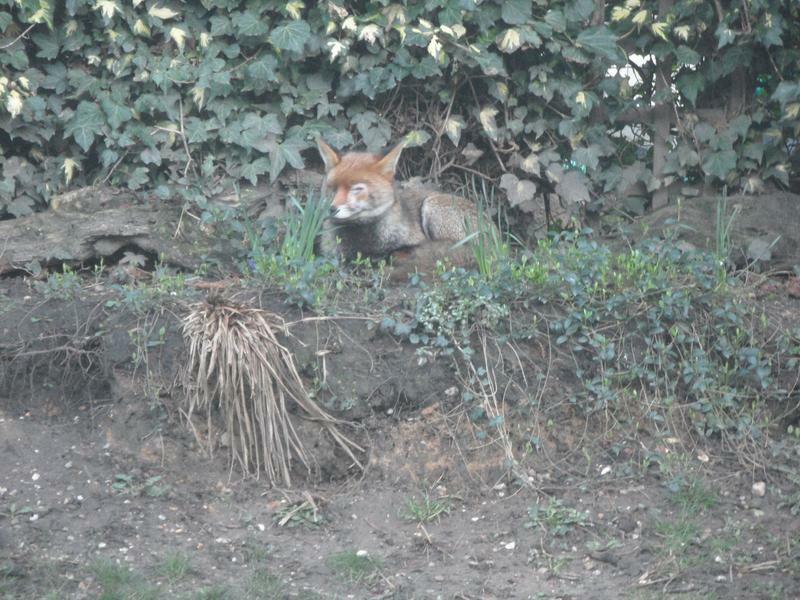 One of the foxes waiting for breakfast at the end of the garden. 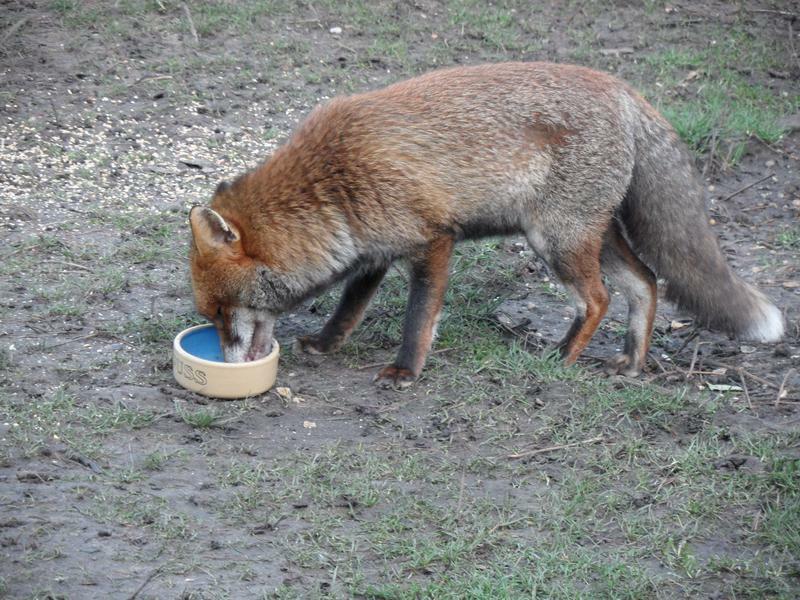 March 2014, already had a small bowl of dog food, but waiting for more. 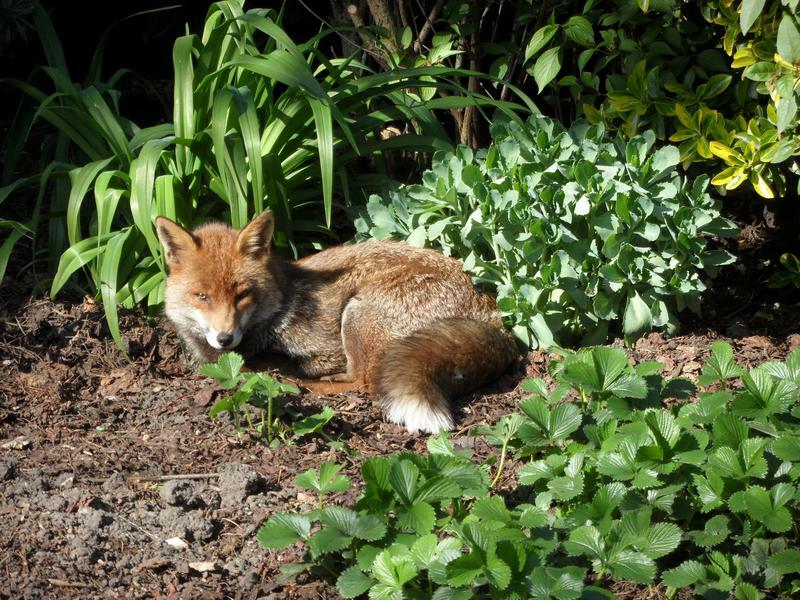 End of March 2014, brighter mornings so clearer photographs. 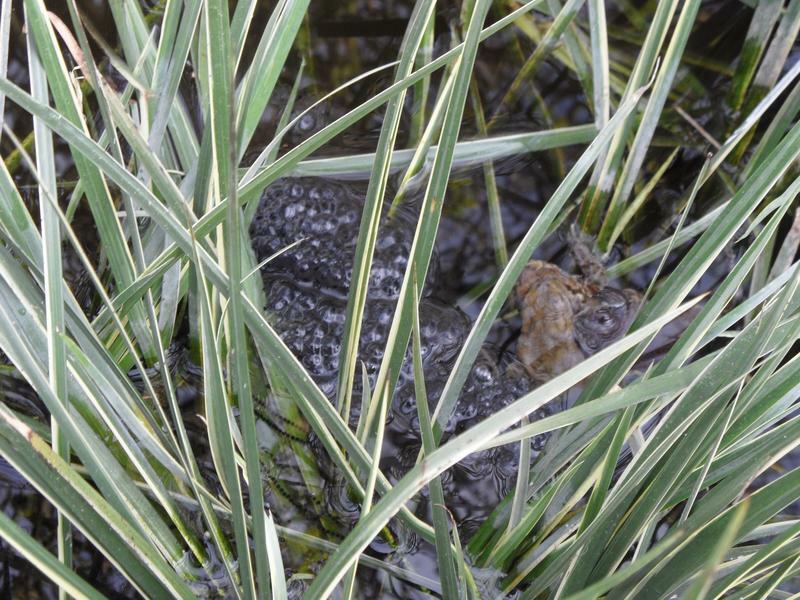 lot of frog and toad spawn, here are a mating pair of frogs, with strings of toad spawn visible. 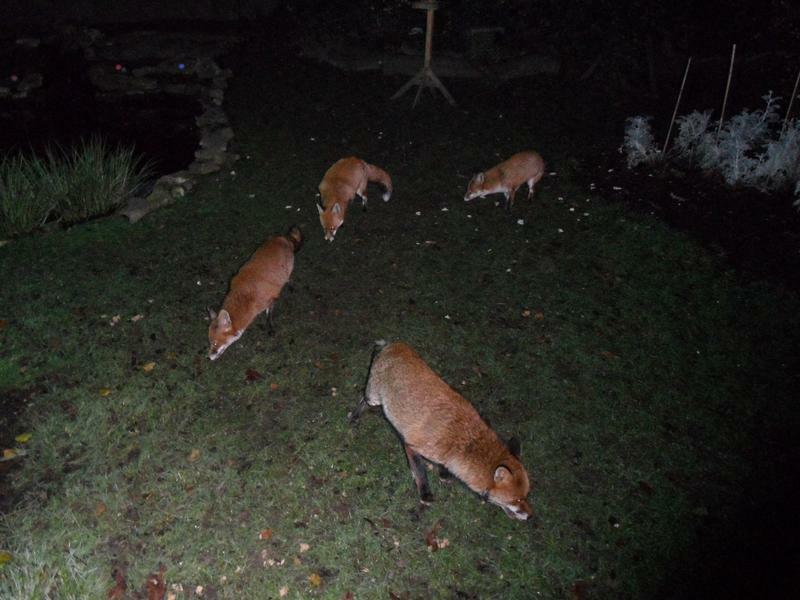 More fogs sitting on bubbles of frog spawn. 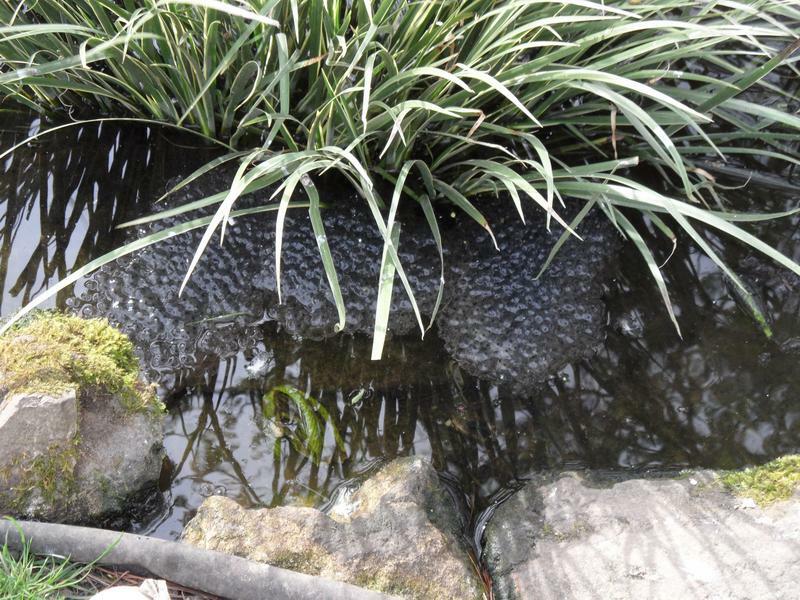 Different plant, more strings of toad spawn and bubbles of frog spawn, with a pair of toads. 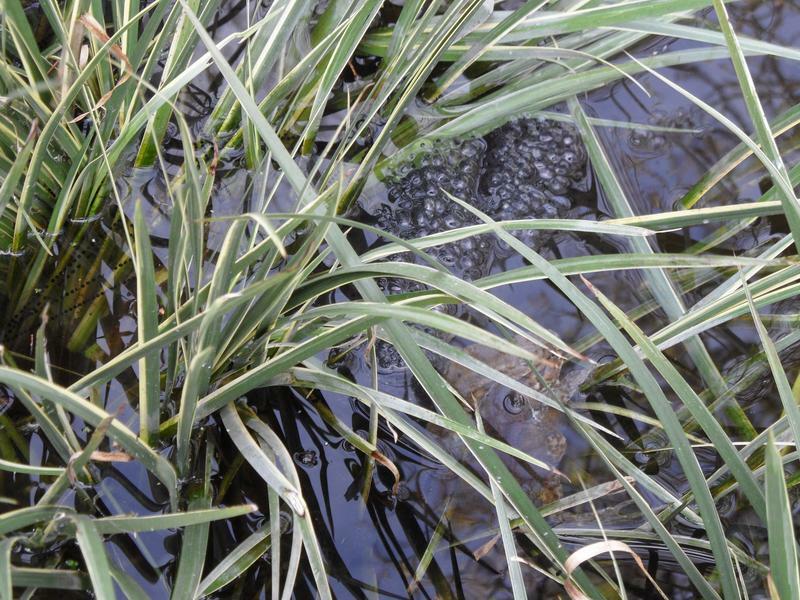 this year there seem to be about 15 clumps, so at least that many female frogs, but they only spend one day a year in the pond. 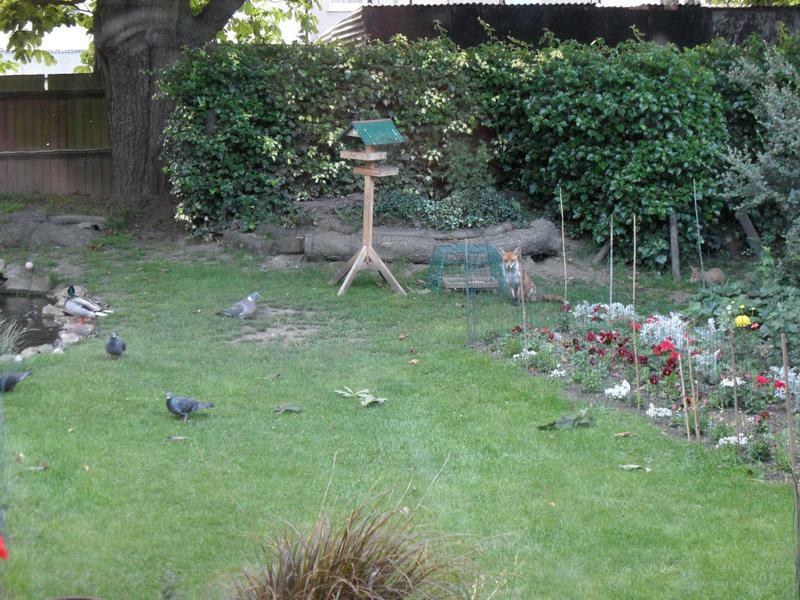 A few boys live here all year around, but many more visit. 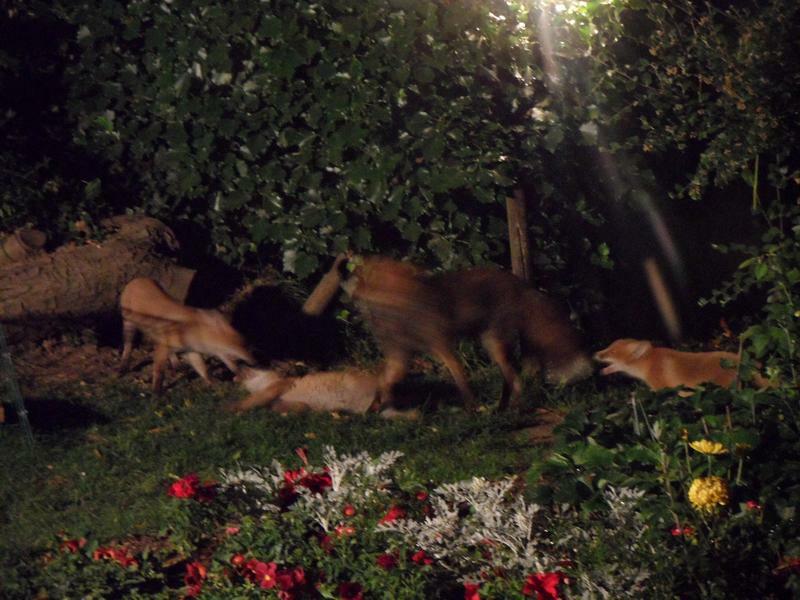 There were probably 200 to 300 toads and frogs on the busiest night. 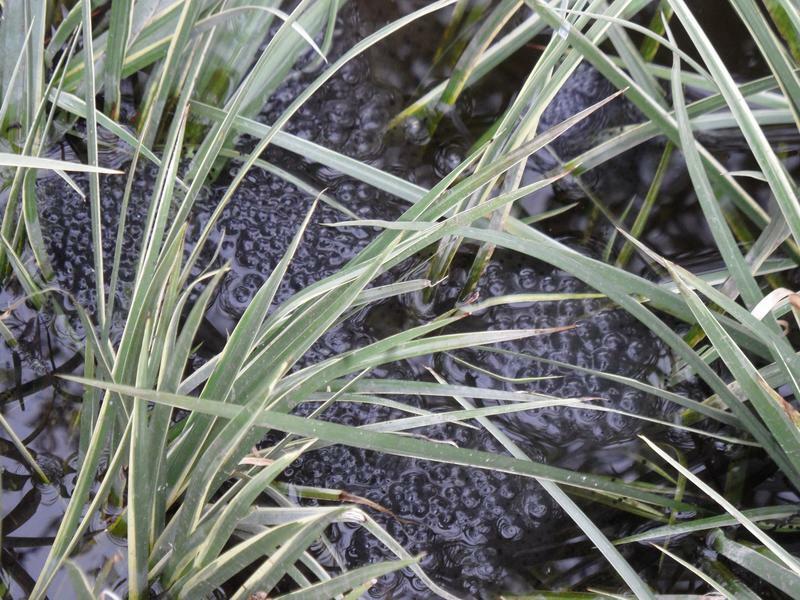 Yet more clumps of frog spawn from several frogs. 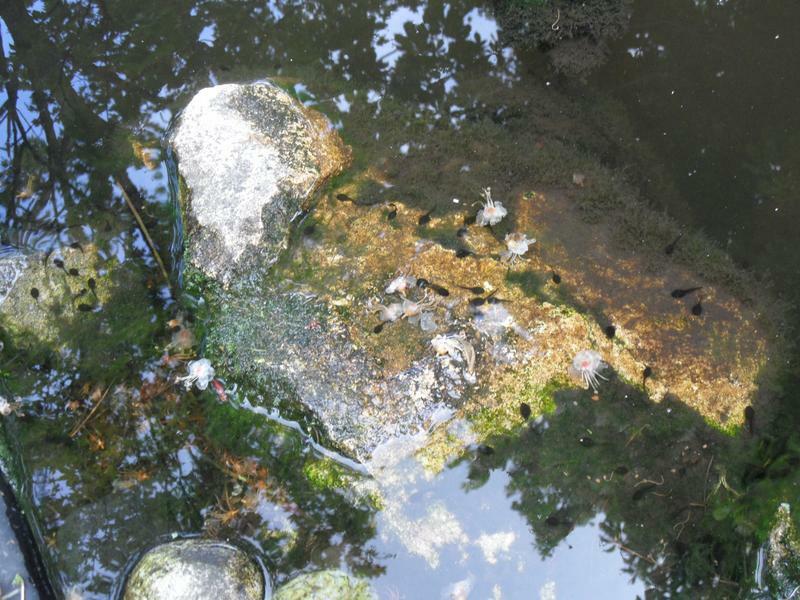 24th April 2014, the pond is now full of tadpoles. here eating algae growing on the rocks. 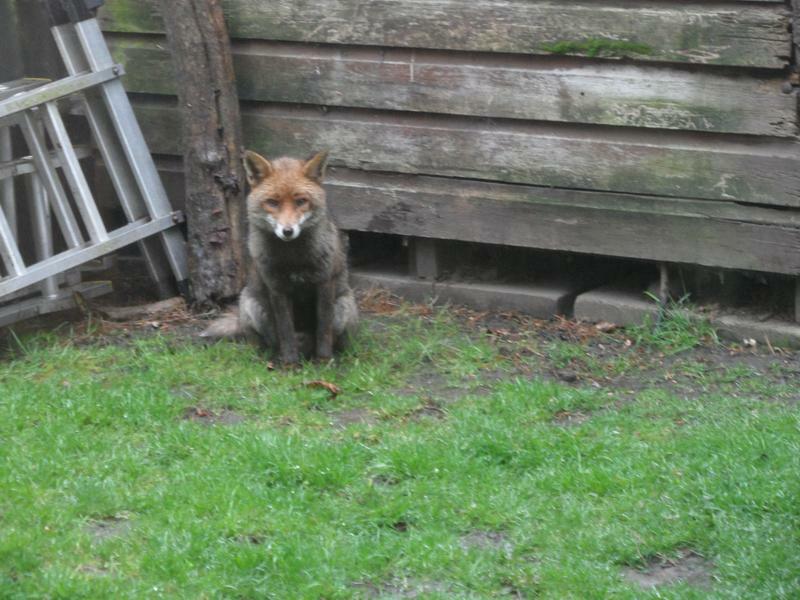 April 2014, waiting by the shed for breakfast. 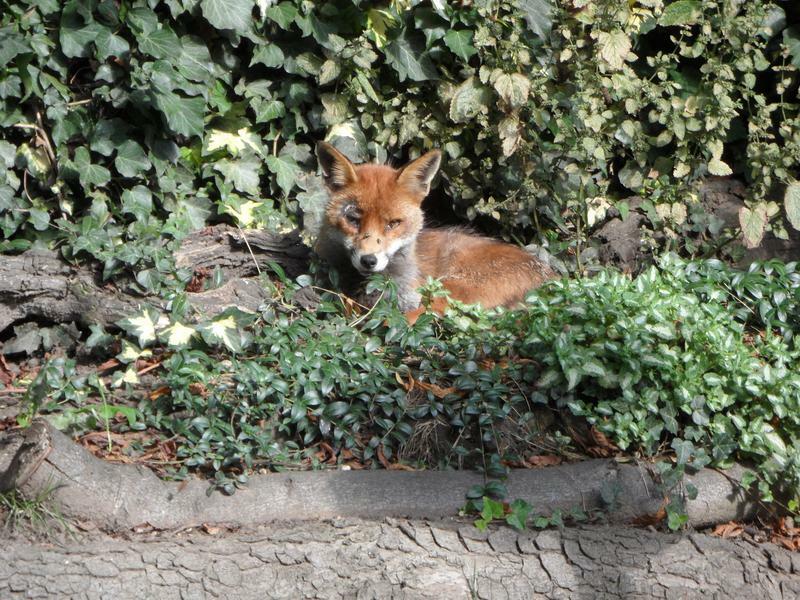 Next day, waiting by the hedge. 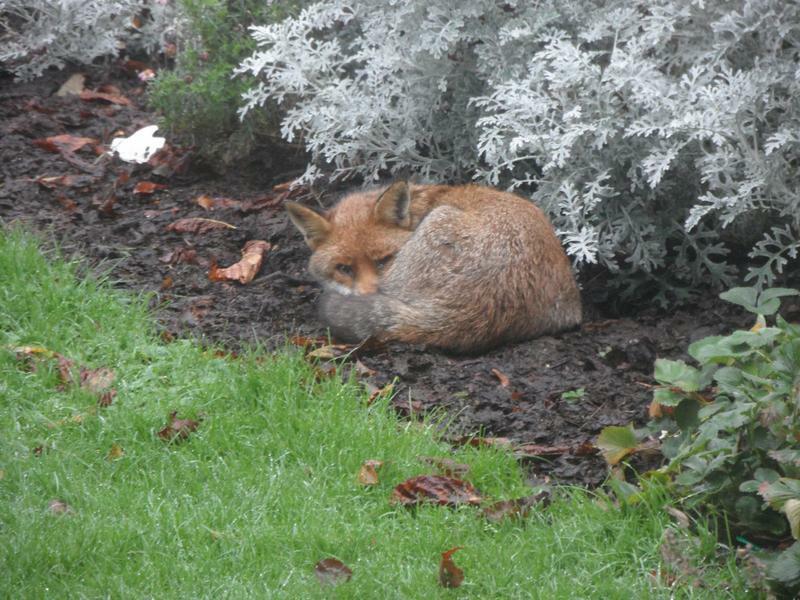 Mid afternoon, don't often see her other than morning and evening, but today she's sleeping in the flower bed. 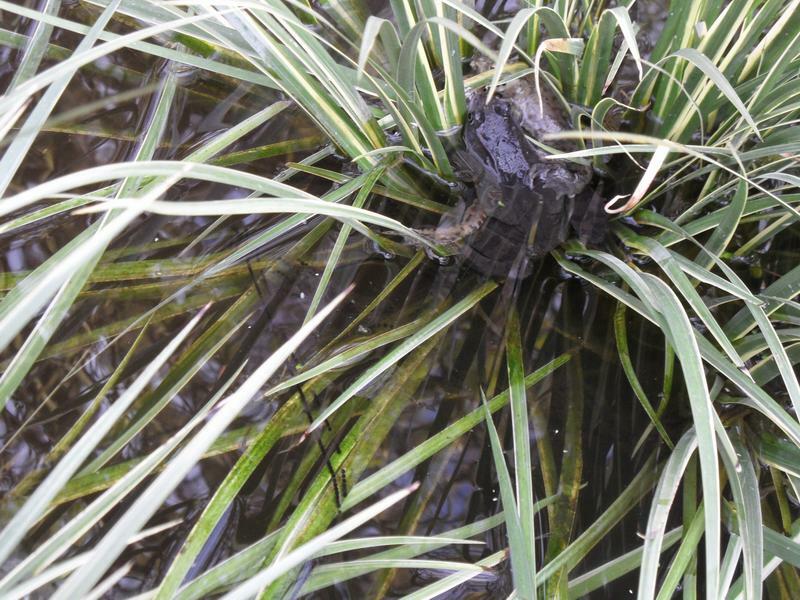 was struggling to get to the pond edge. 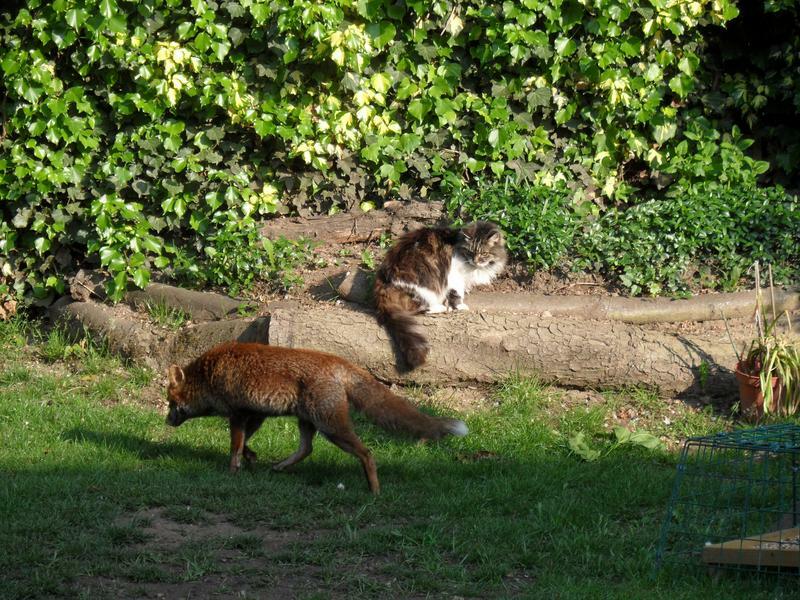 Another morning, Suzy the cat and the fox were both sleeping at the end of the garden, the fox got up when I approached with more food. 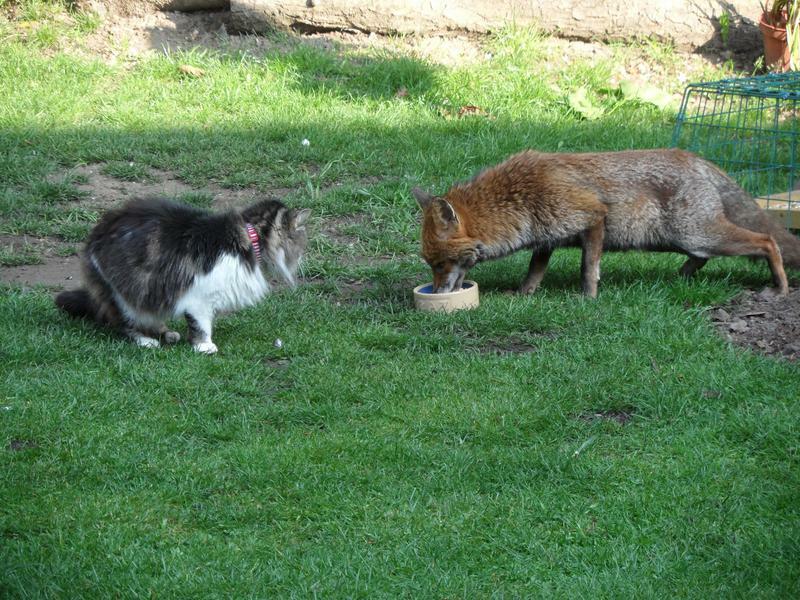 Suzy gets to the food first, it's dog food not cat food. 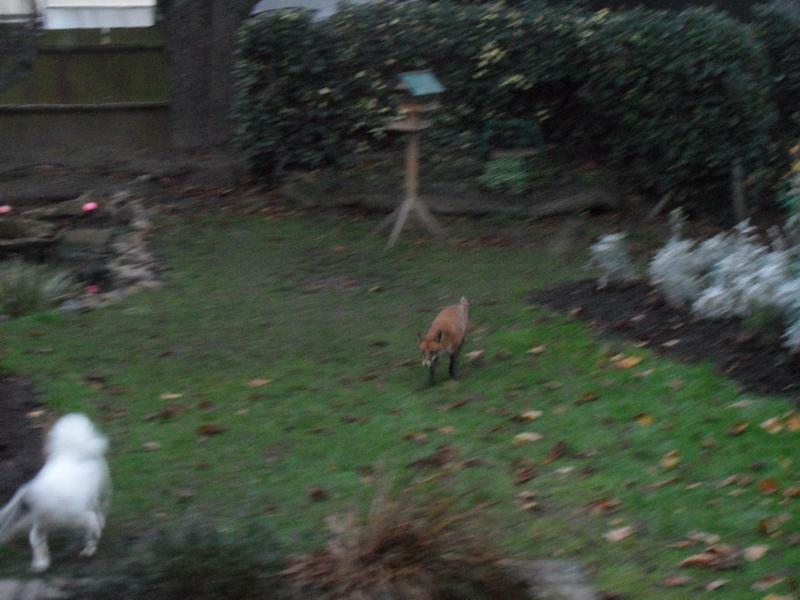 But the fox is still too hungry, so creeps up. 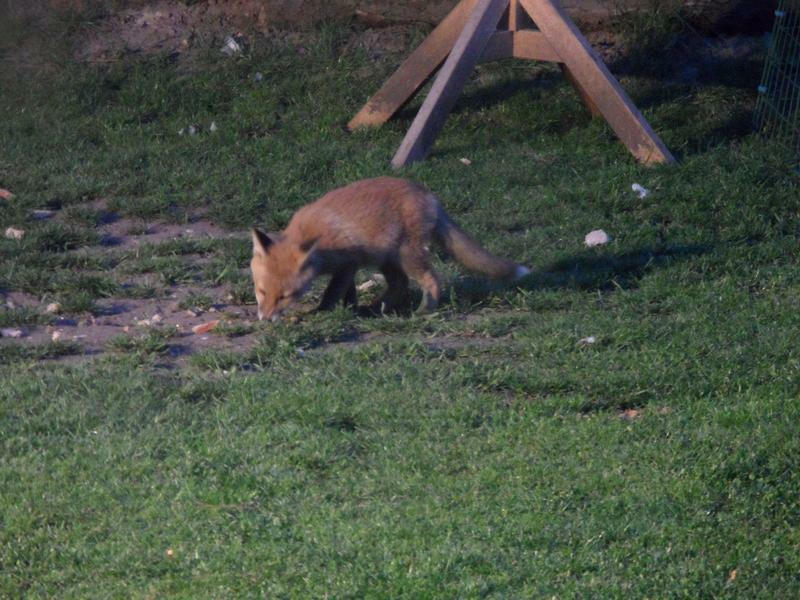 May 2014, while tailed fox in early morning. 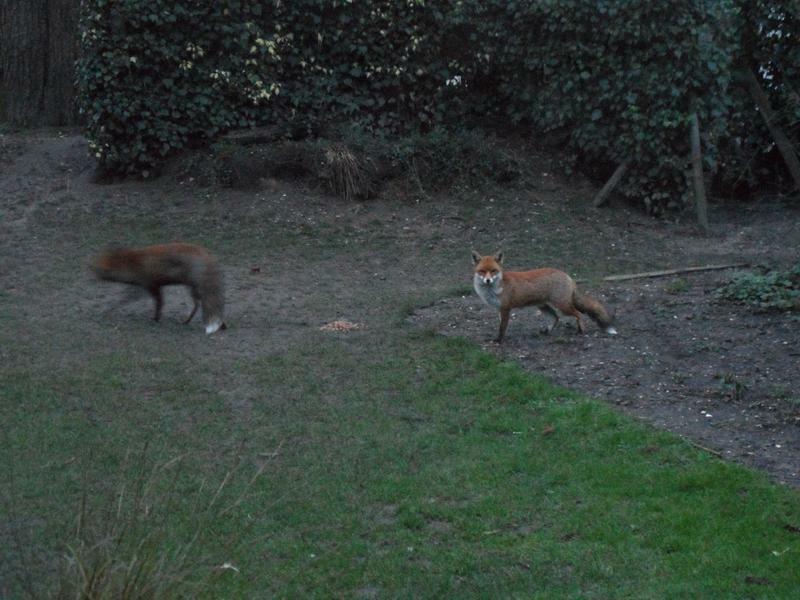 Joined for breakfast by white shirt fox, but she's not allowed to eat, and she's got cubs to feed! 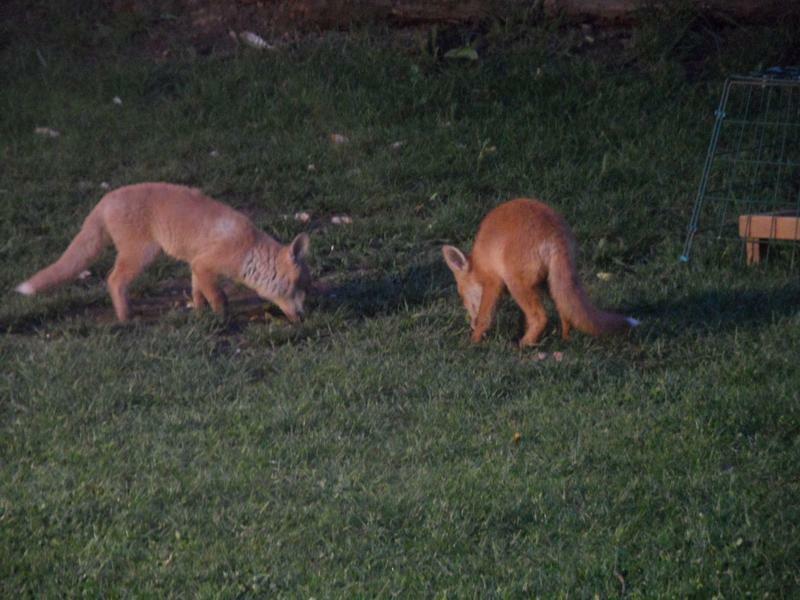 Tried putting out two food dishes, but white tailed fox just ate both dishes. 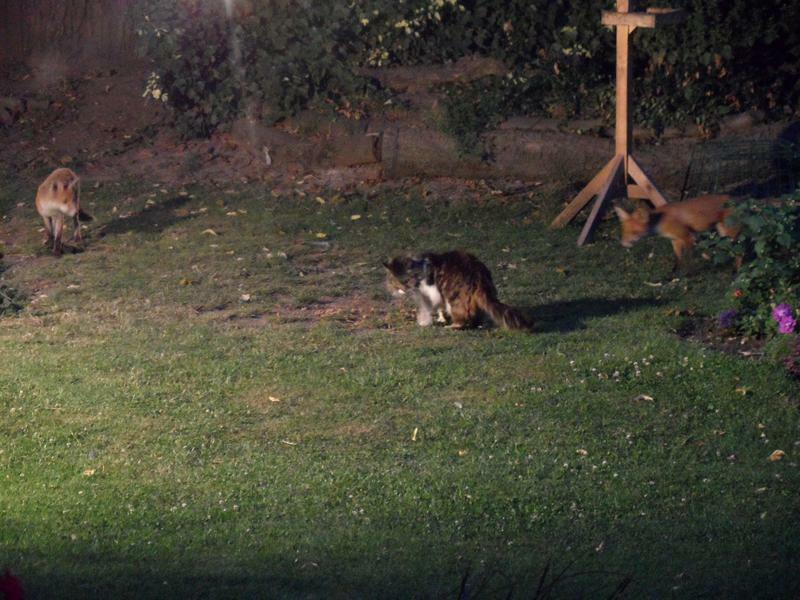 27th May 2014, 9pm, first visit to the garden by a fox cub and white shirt fox, a neighbour two gardens away saw them a week earlier. 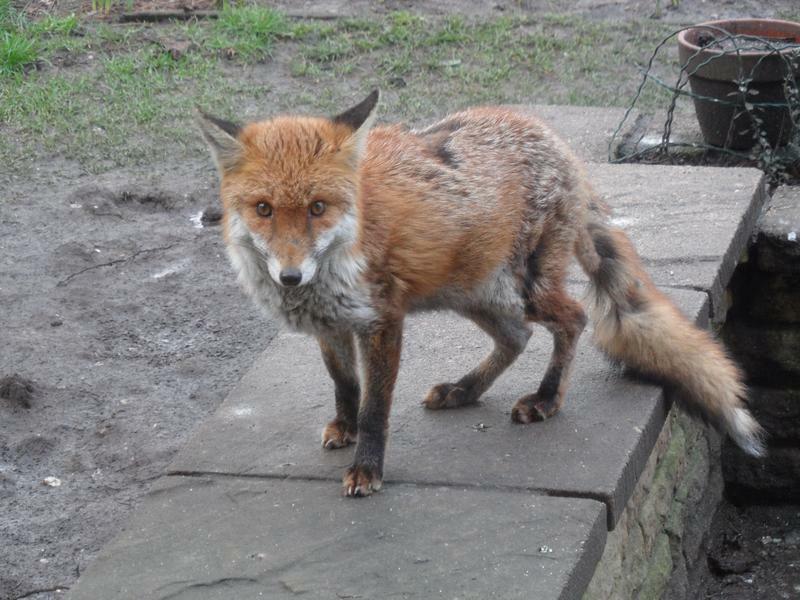 White tailed fox waiting for breakfast the next morning. 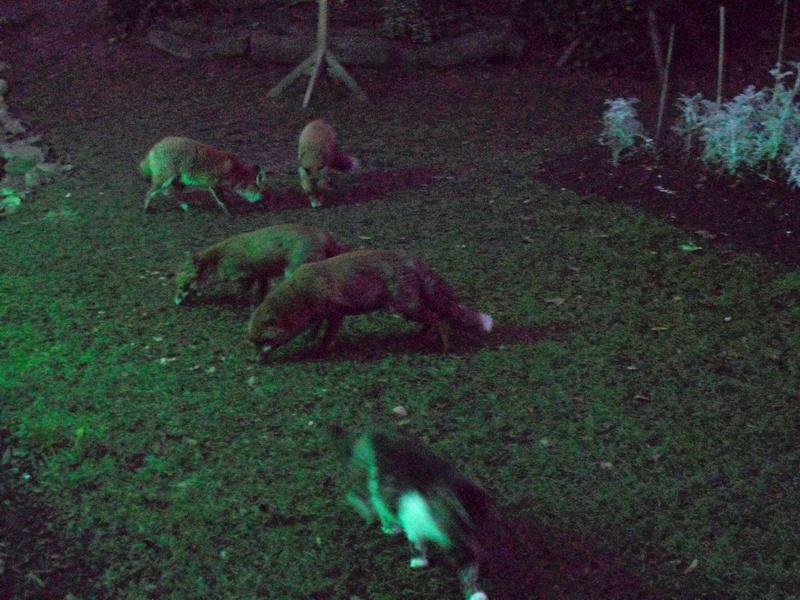 Putting a flood light on each evening, but still shaky photos due to slow shutter speed. 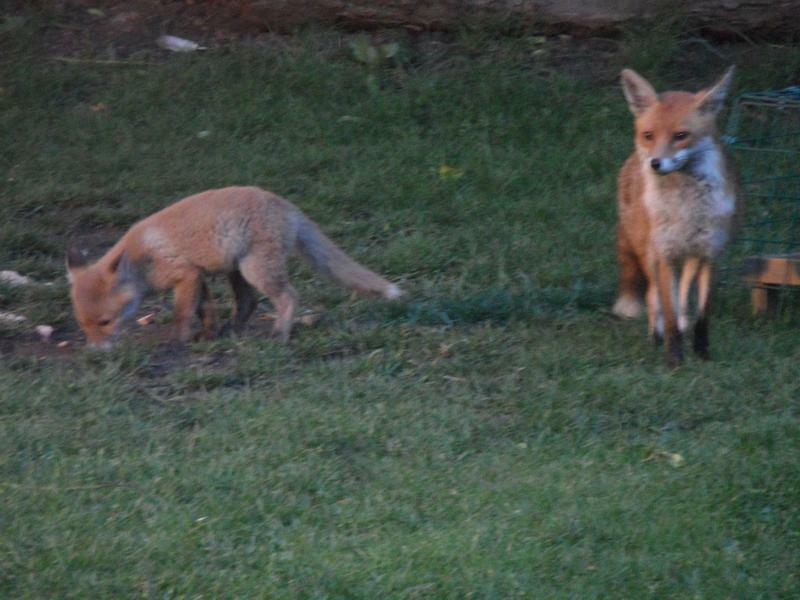 The cub and mother eating. 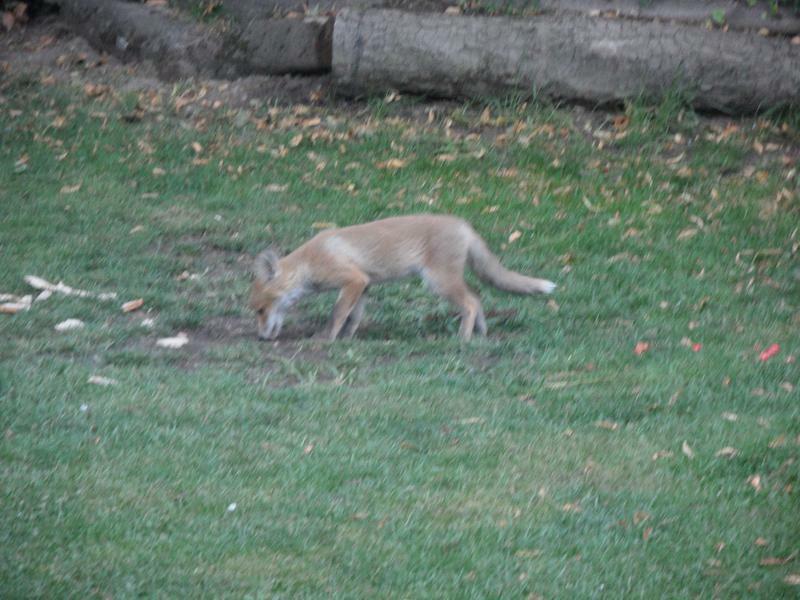 The cub has a white tail as well. 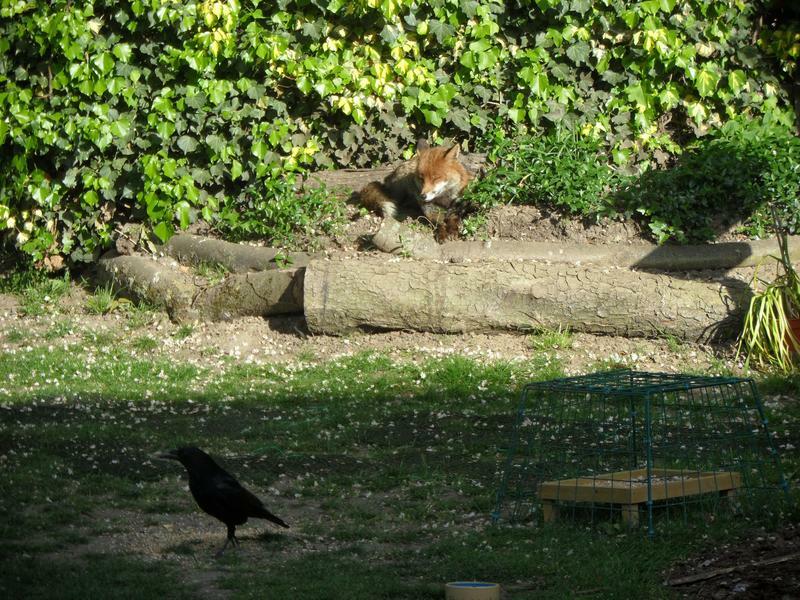 30th May 2014, 8am, one of the fox cubs comes for breakfast in day light. 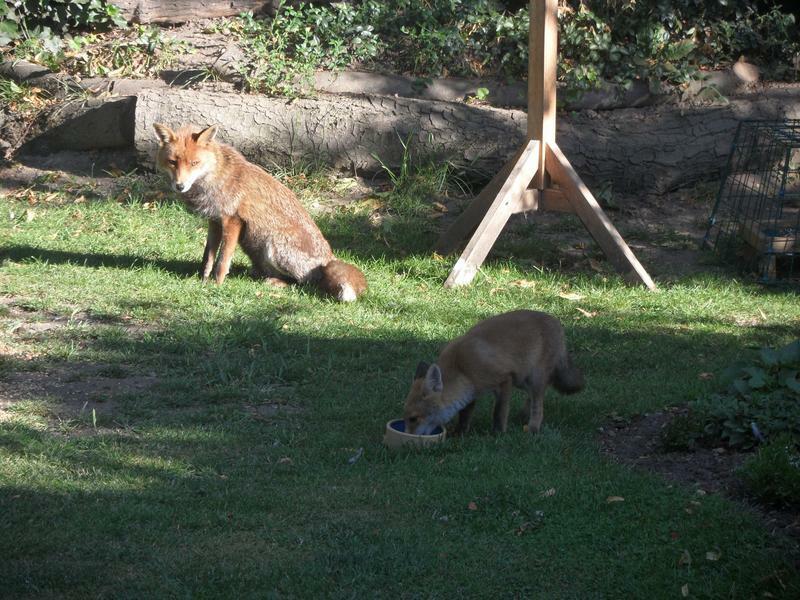 The cub licks the bowl again. 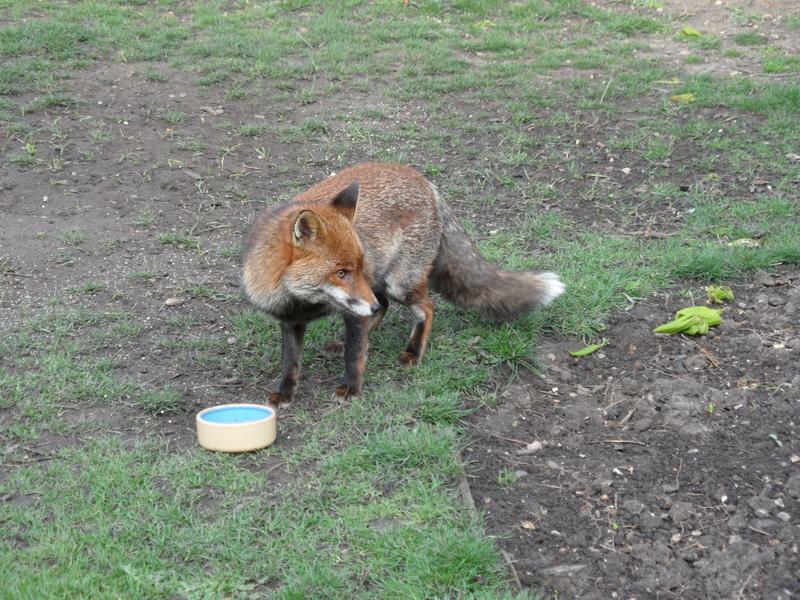 I refilled the bowl, but the cub did not come back. 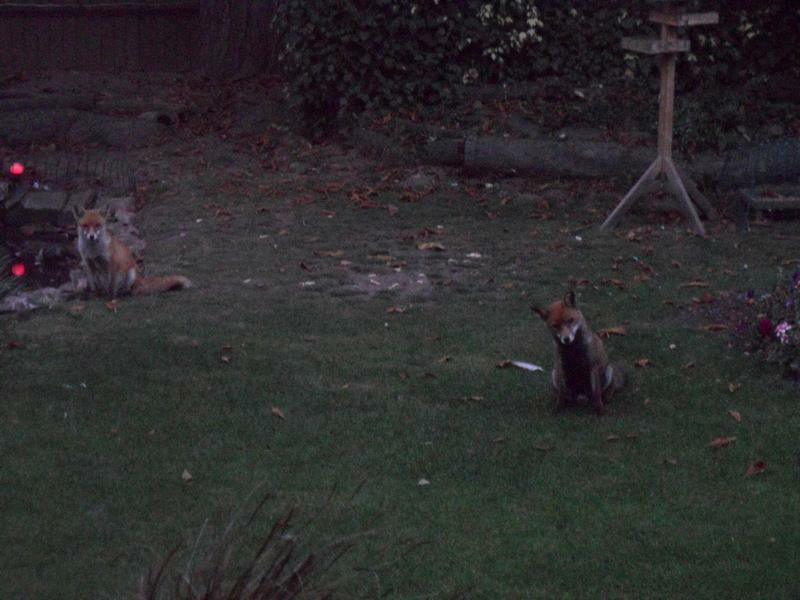 7.30pm, white shirt now sits at the end of garden each evening, waiting for food for her cubs. 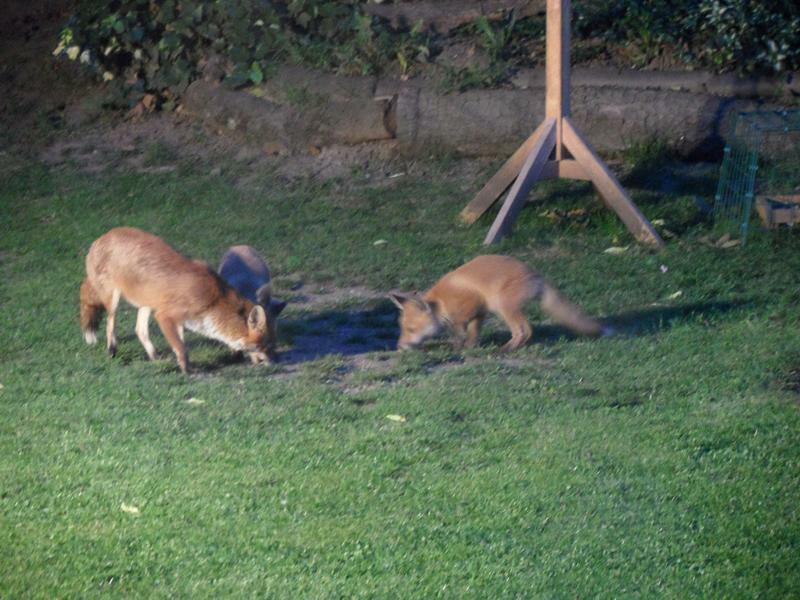 9pm, There are at least two fox cubs, but getting photos of them together is difficult because they never stay still for more than a moment. 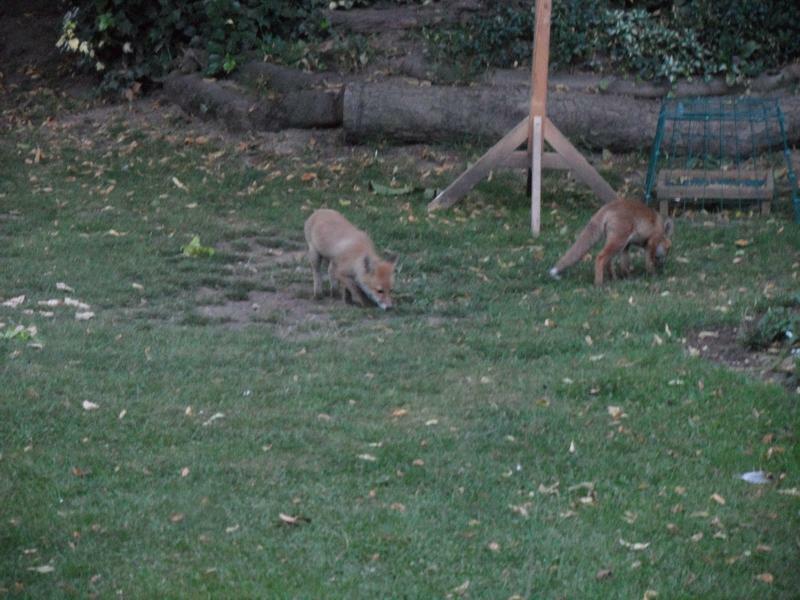 Noth cubs look the same, no idea how we'll tell them apart. 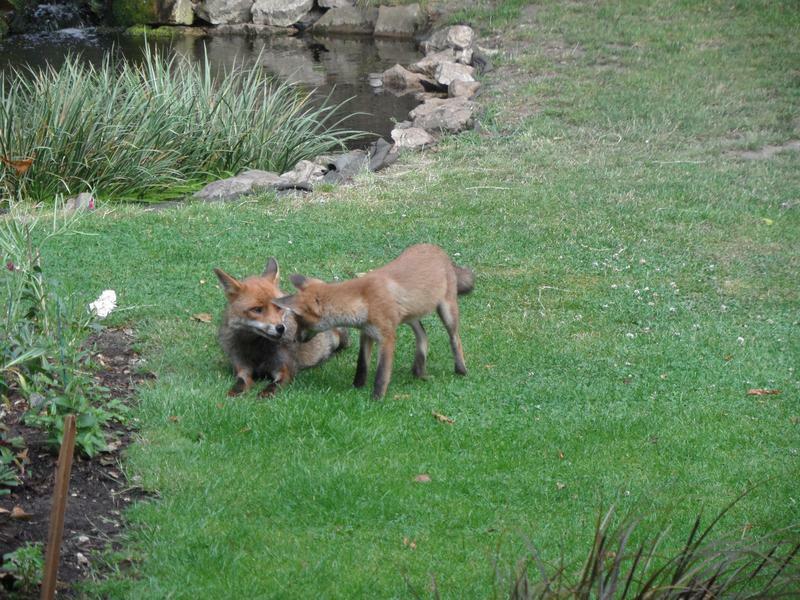 Still running around with mother. 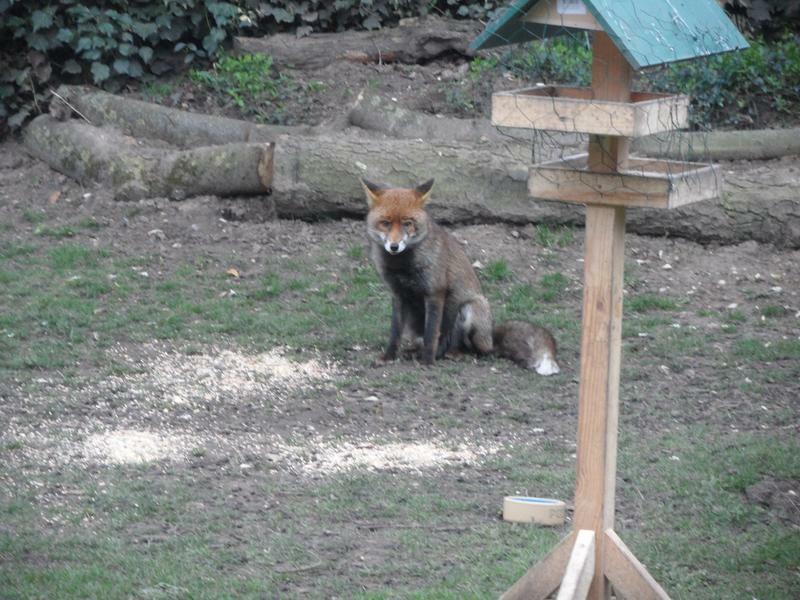 Much more peaceful the following morning, white tailed fox will sit there for two or more hours waiting for more and more food. 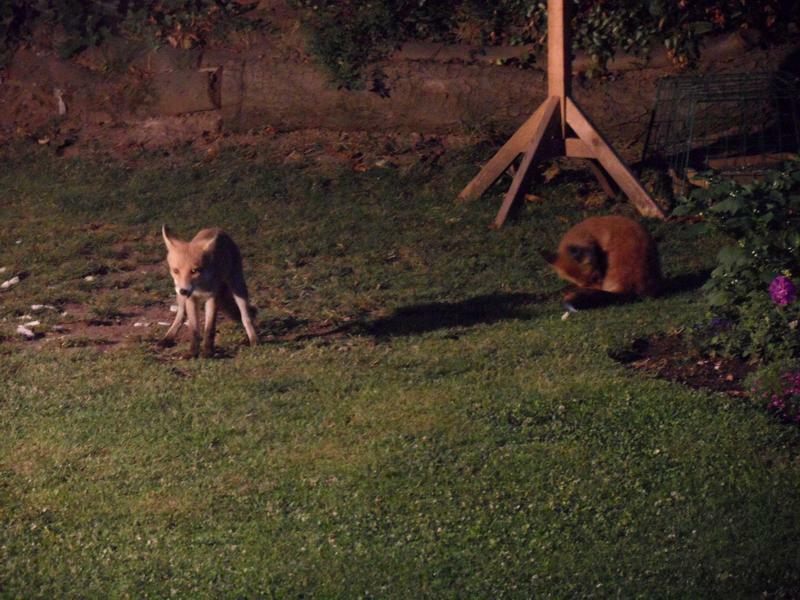 1st June 2014, just one fox cub for dinner tonight, or at least only one at a time. 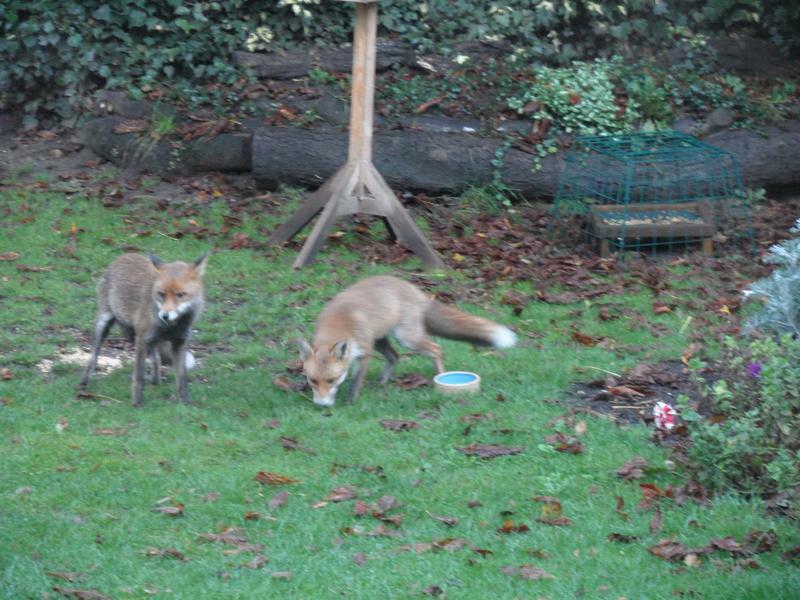 The cubs only seem interested in wet dog food, not bread or dog biscuits. 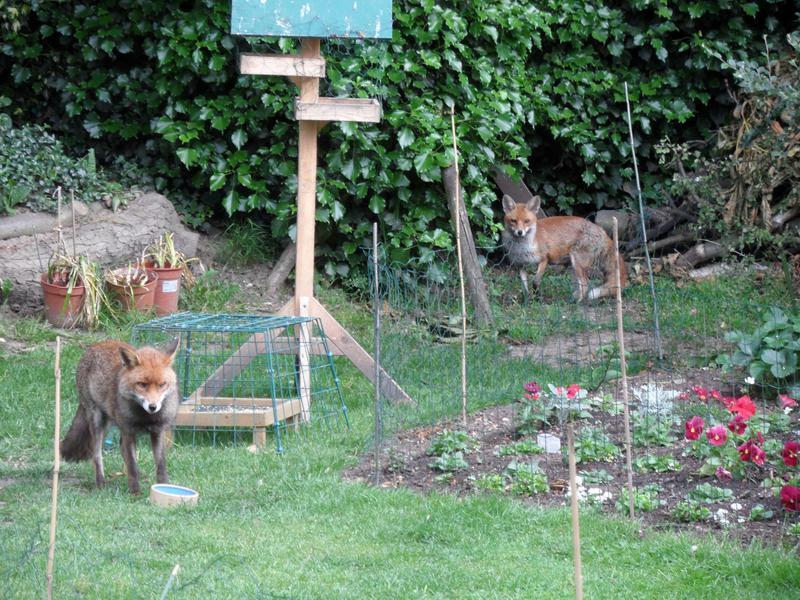 2nd June 2014, there were two cubs, but only one left by the time I got the camera. 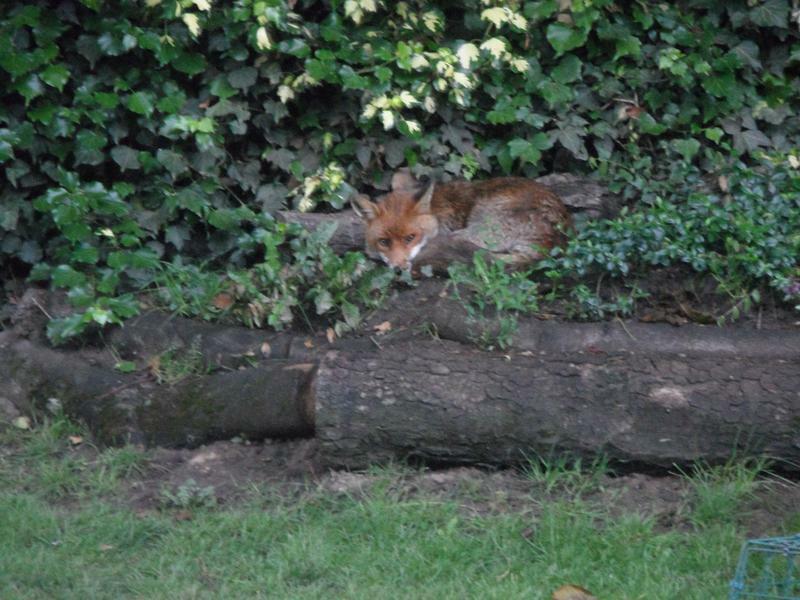 looking at the kitchen and one of the cubs near the hedge. 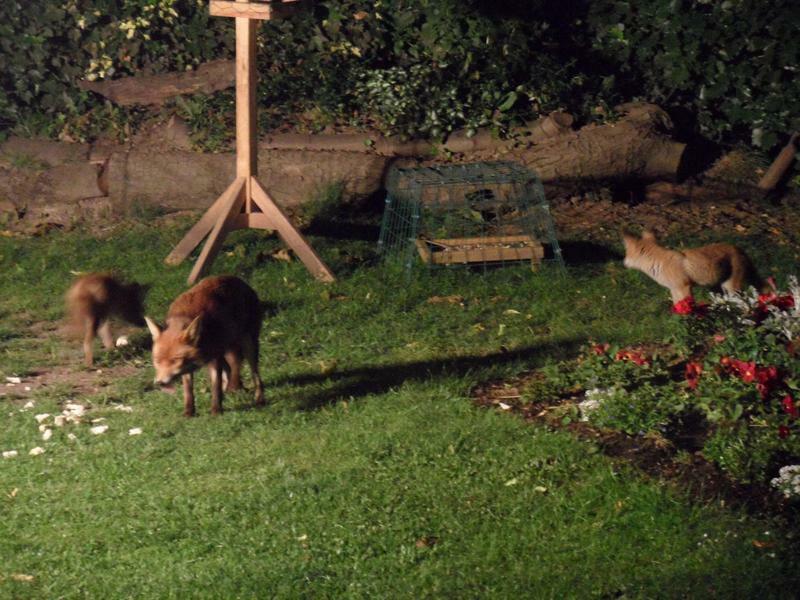 Later, when the garden lights are on, a second cub comes for food. 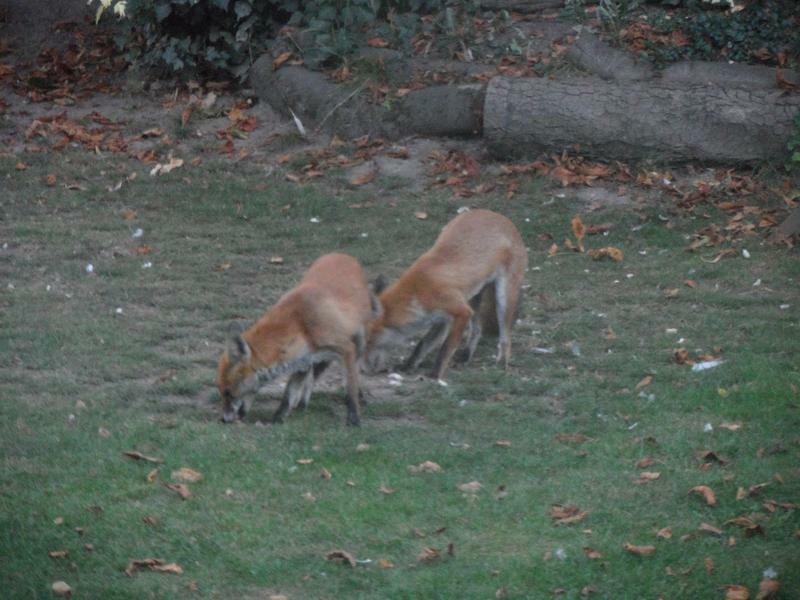 And mother is happy to let them eat alone. 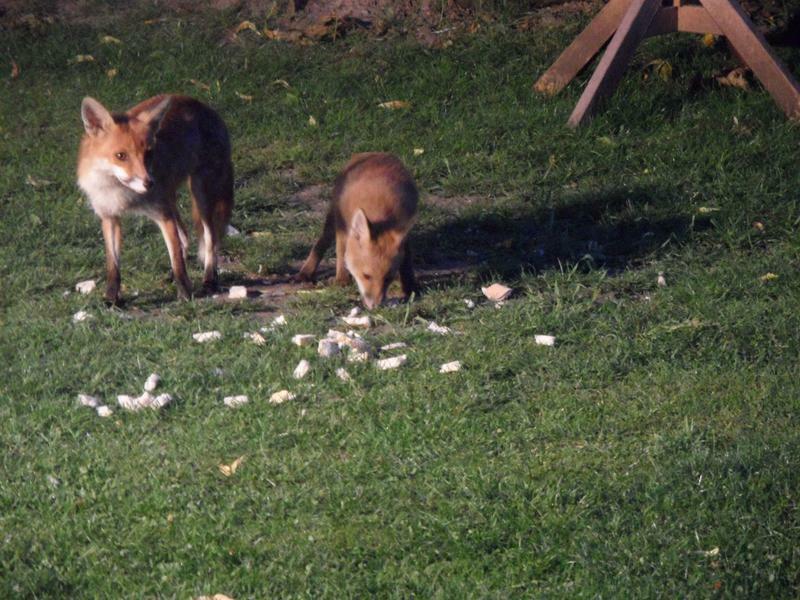 I also put out bread so the birds don't eat the fox's dog food, and sometimes they try the bread. 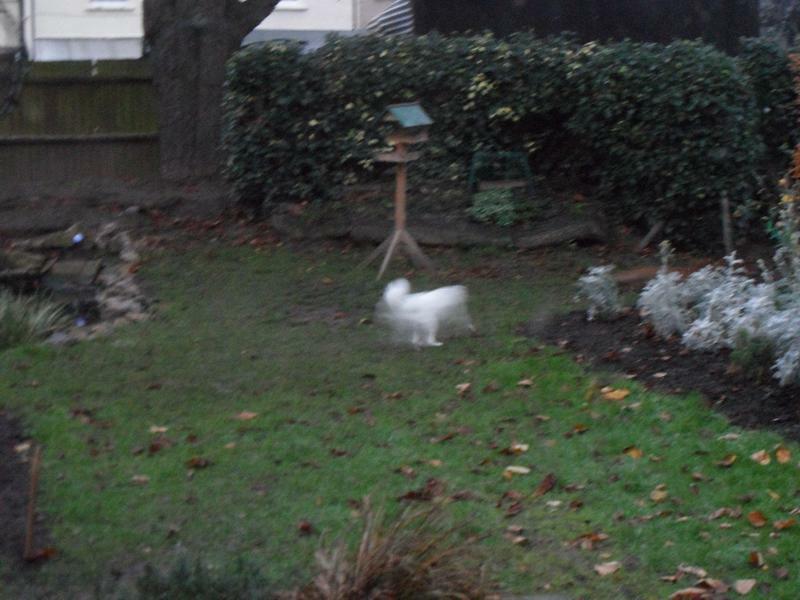 not sitting still for me to get a decent photo with the slow shutter speed needed at 10:20pm. 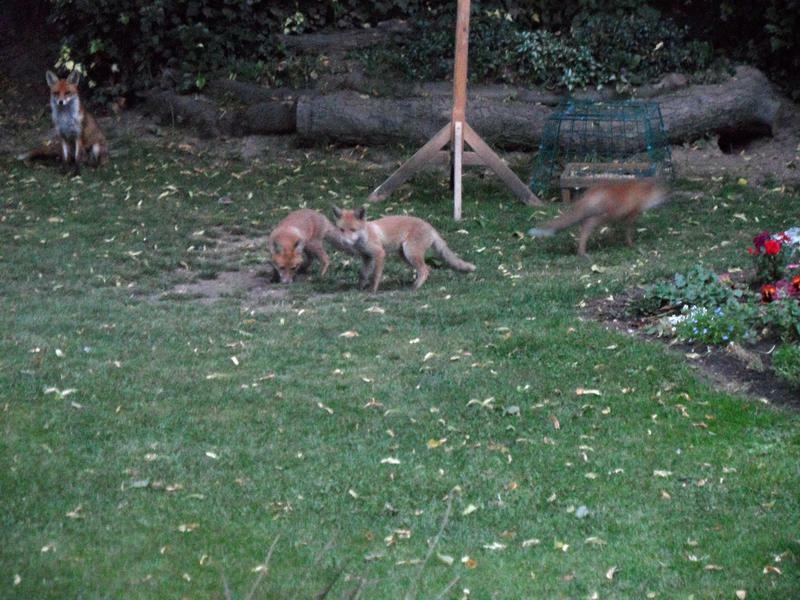 Just two cubs and mother, the third cub is out of shot. 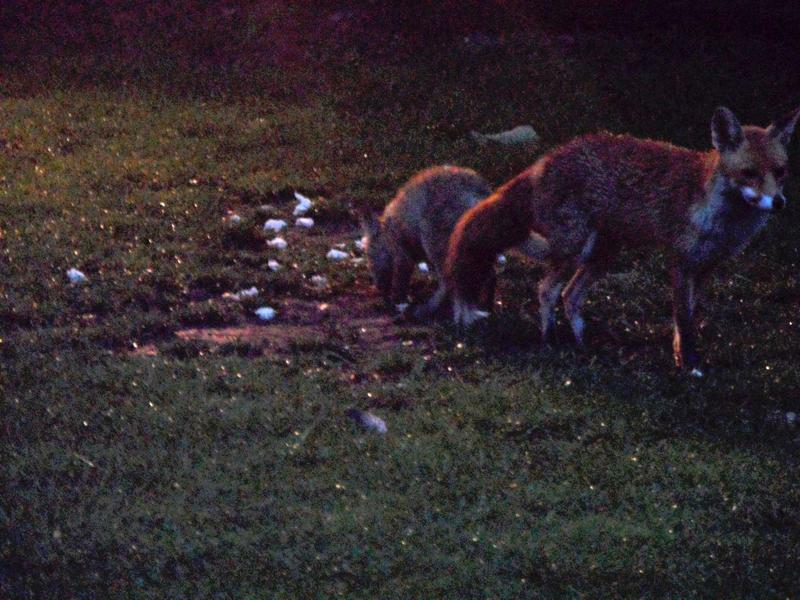 16th June 2014, 9.30pm, two cubs come with mother for food. 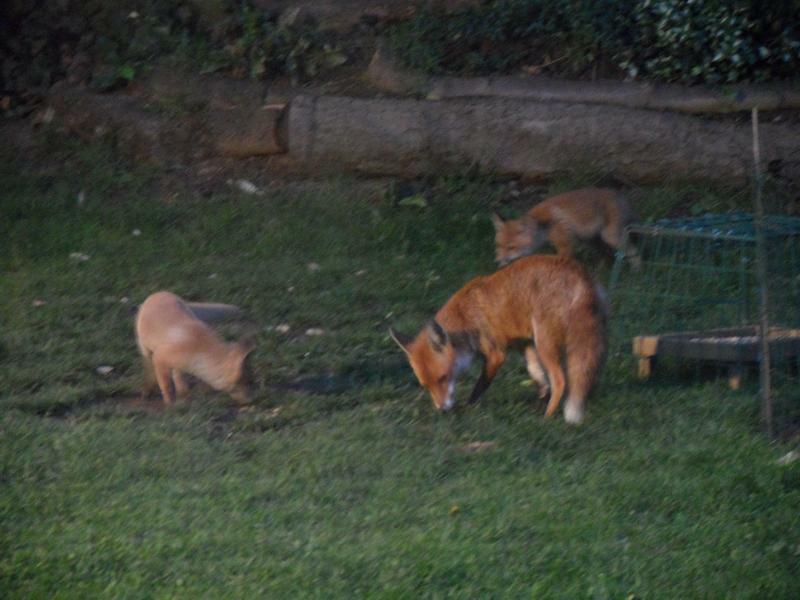 And then the third fox cub joins them. 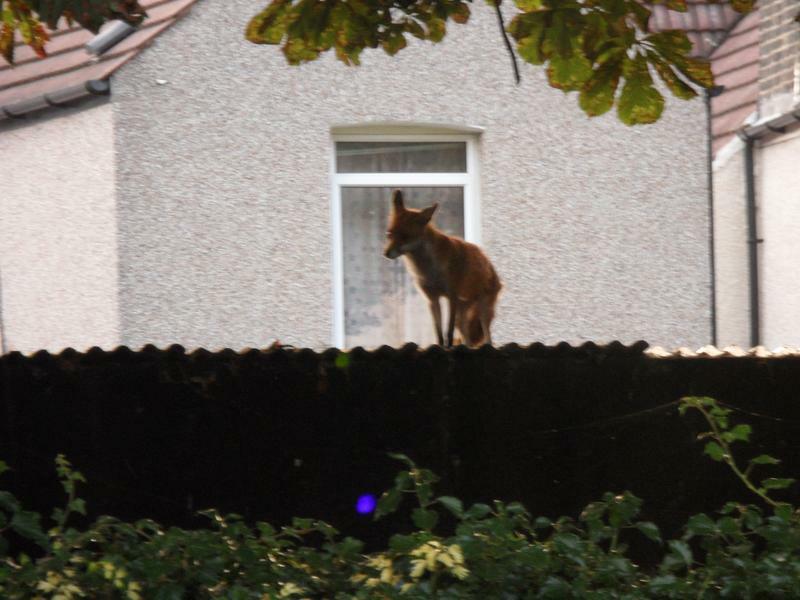 The next day the dog is sitting on the lawn in the evening, so white shirt fox sits on a shed roof waiting for her to leave. 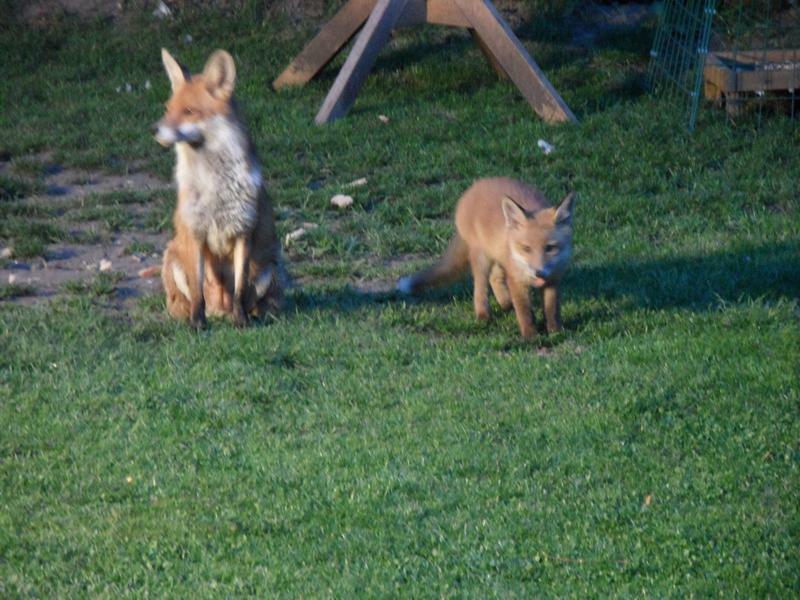 cub, and they are visibly larger already. 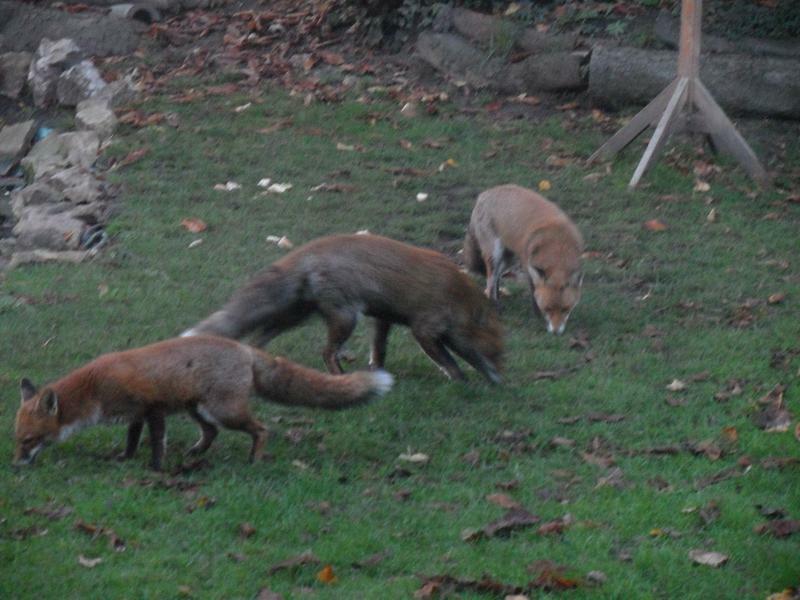 One of the cubs is much paler than the others. 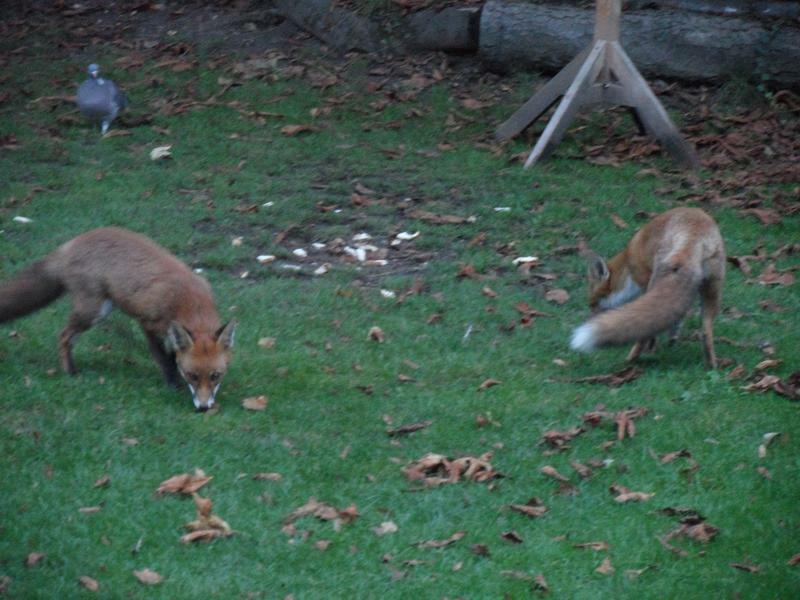 The pale cub again, still a white tail. 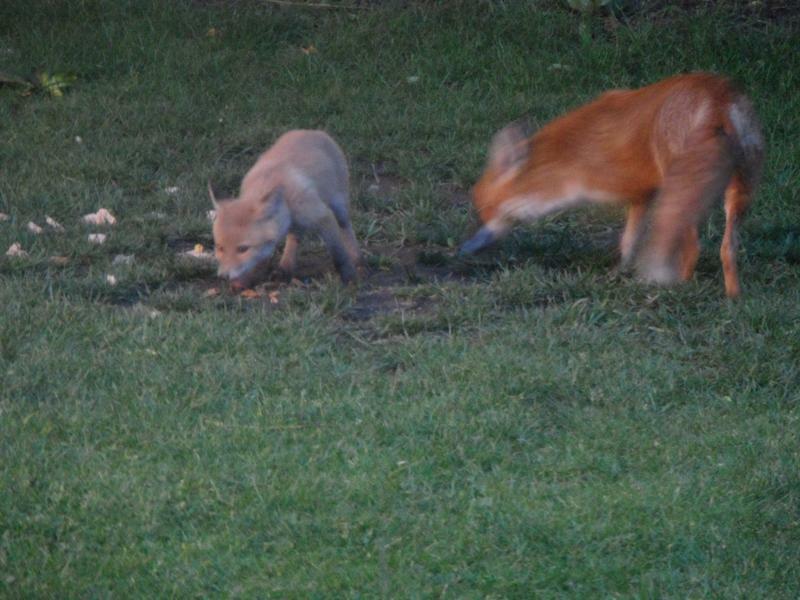 26th June 2014, one of the cubs comes to breakfast, and white tailed fox lets her eat. 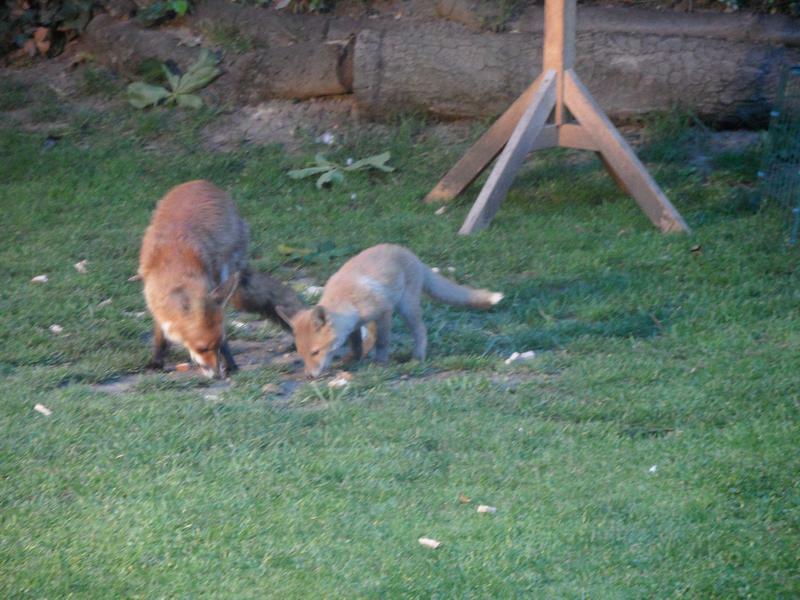 1st July 2014, today two cubs come to breakfast at 7.30am, does not happen often. 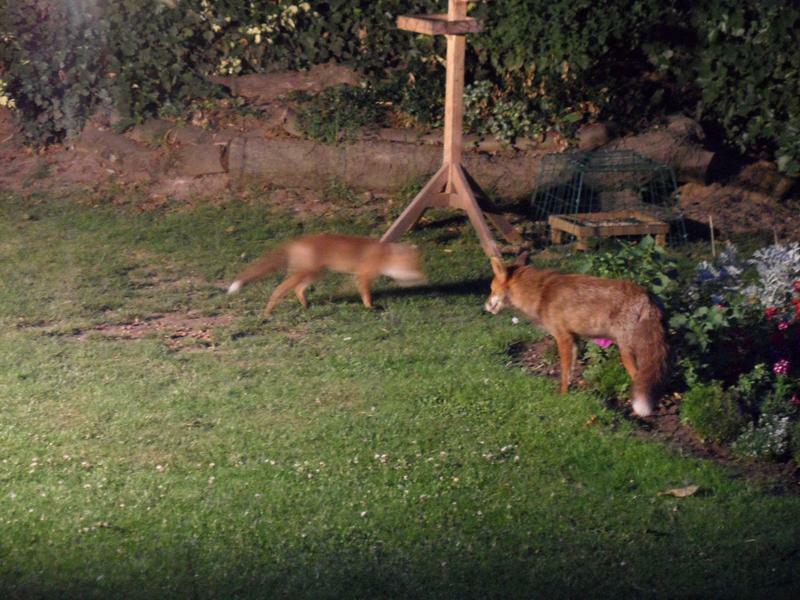 9.30pm, the two cubs are back again for dinner. 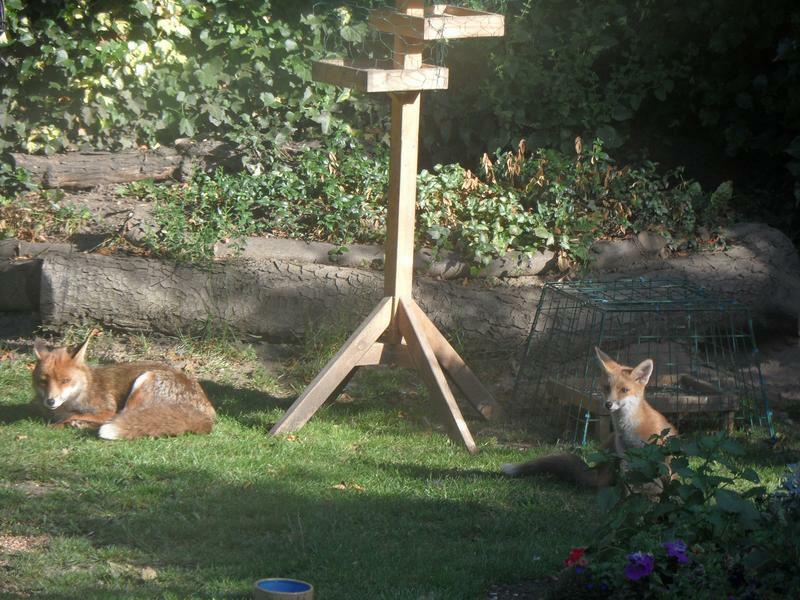 7th July 2014, while mother will wait hours for breakfast, it's unusual for a cub to wait as well. 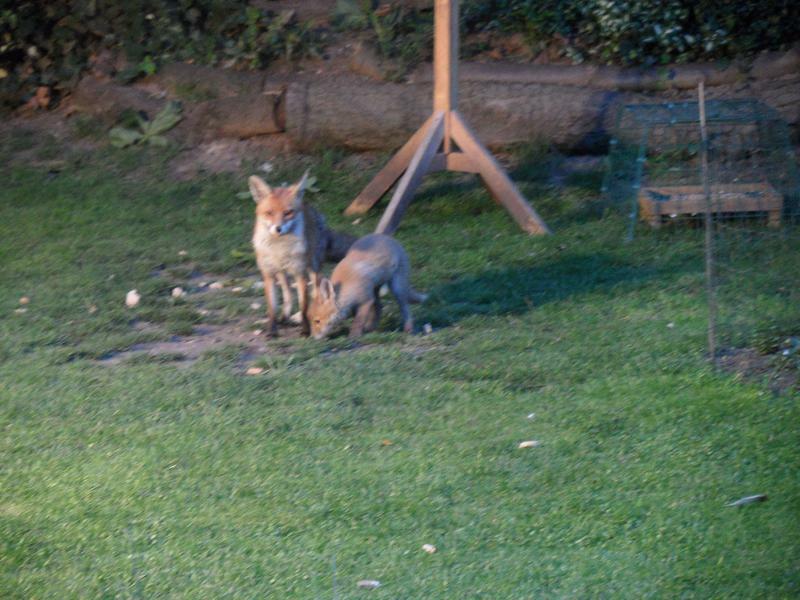 But the cub is bored so goes to say hello to mother. 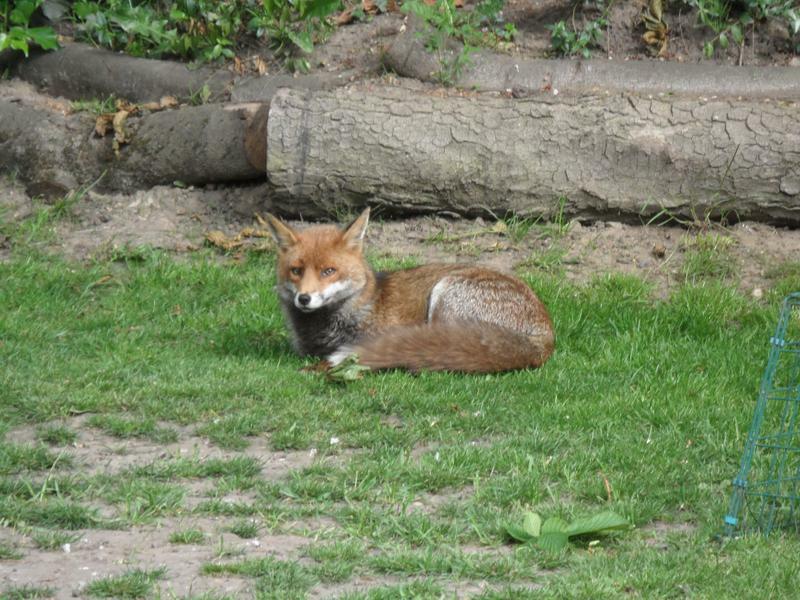 Mother perhaps wants to just sleep. 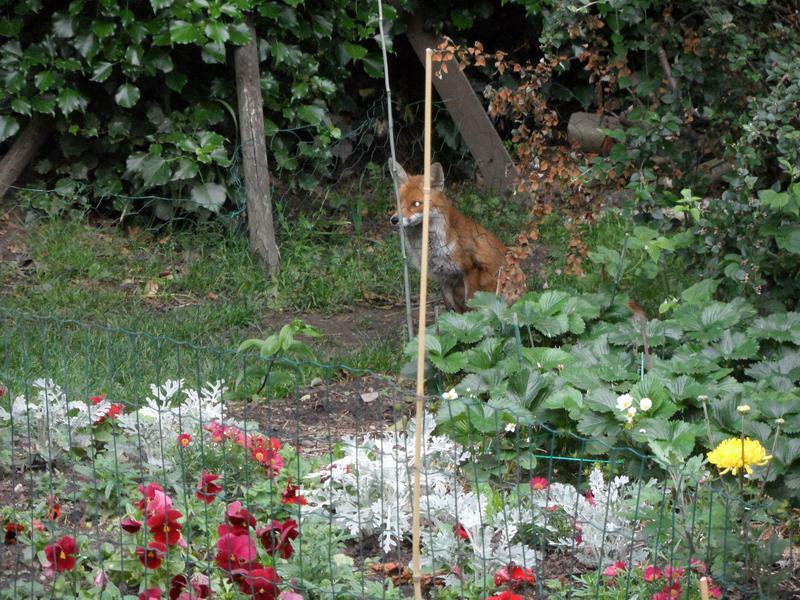 10th July 2014, white tailed fox waiting for dinner. 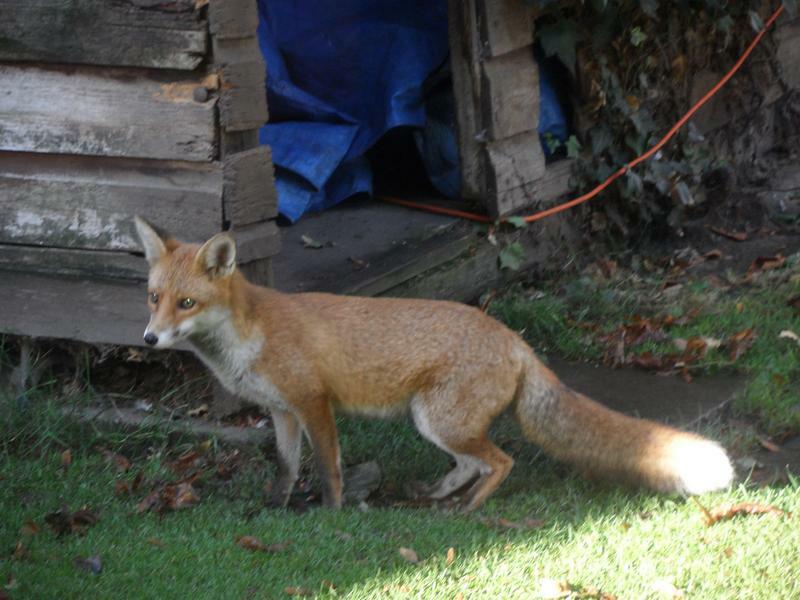 Safely away for Lucy, who can not jump onto shed roofs. 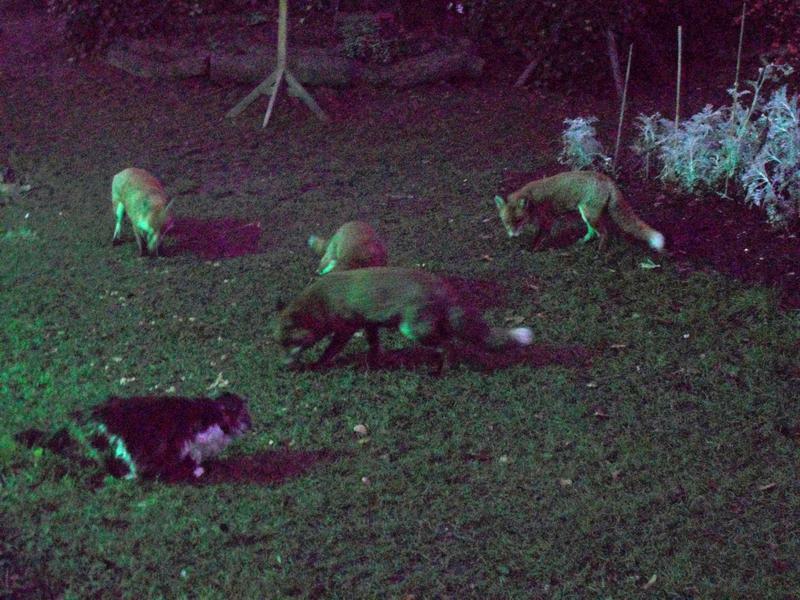 But once Lucy has gone to bed, the foxes come for dinner. 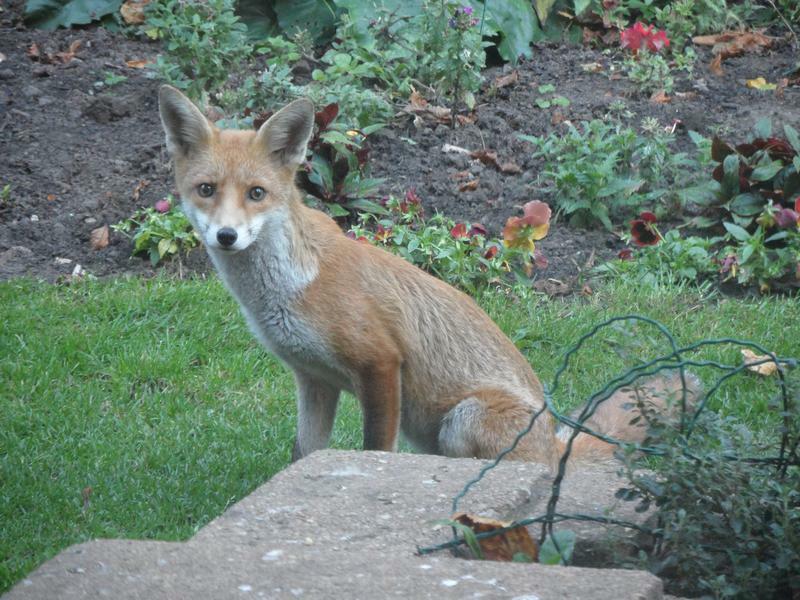 14th July 2014, white tailed fox looking straight into the kitchen window waiting for breakfast. 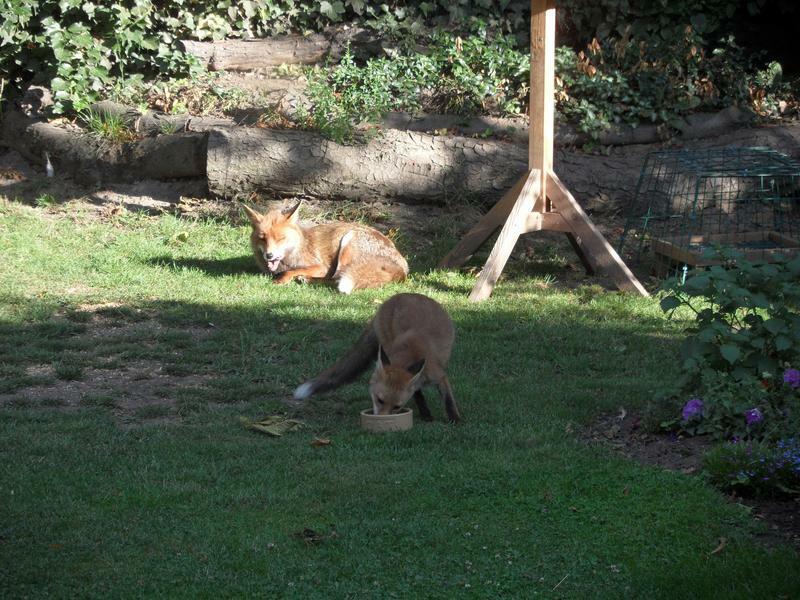 But once she's had her food, one of the cubs is allowed to eat. 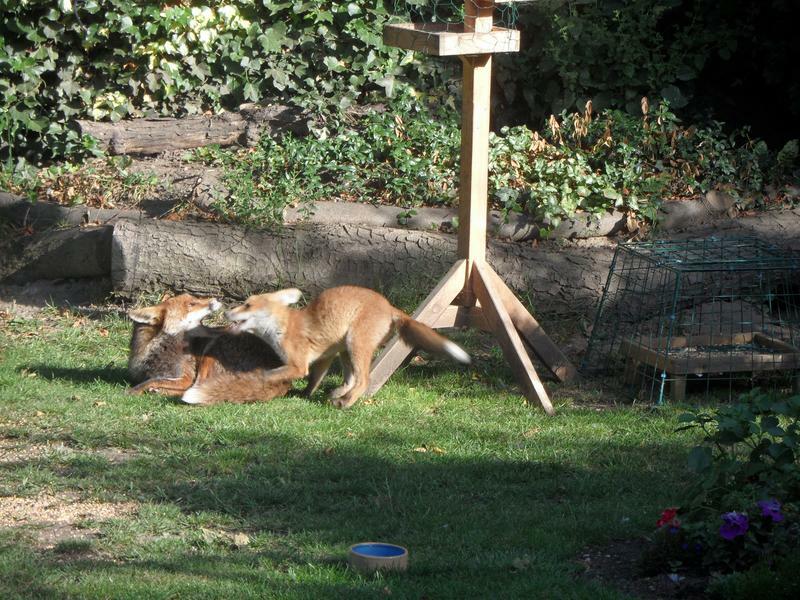 17th July 2014, another morning, waiting for breakfast again, and the cub wants to play. 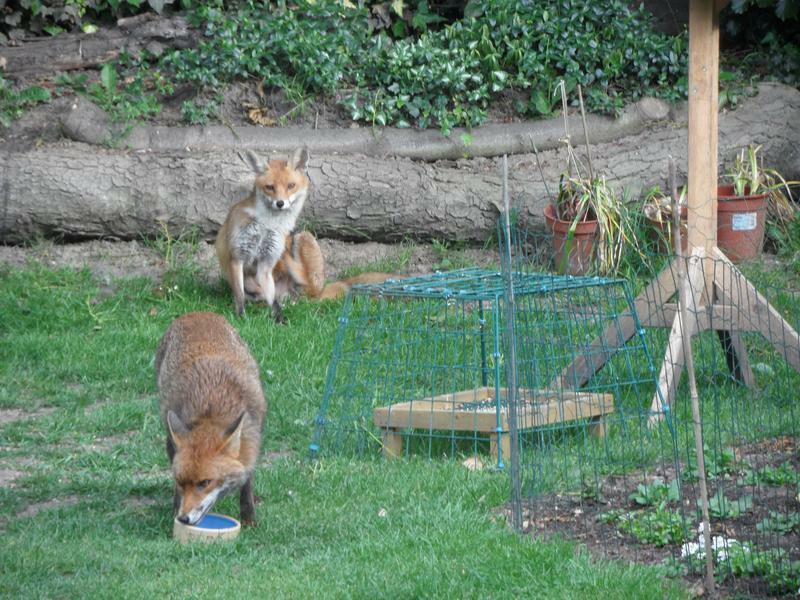 19th July 2014, two cubs eating dinner. 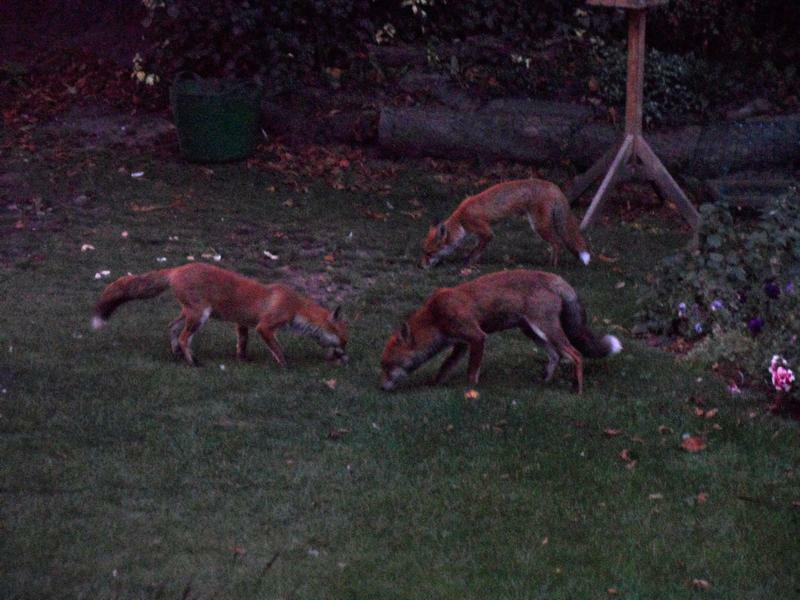 The cubs now try staring at the kitchen window hoping more food will arrive. 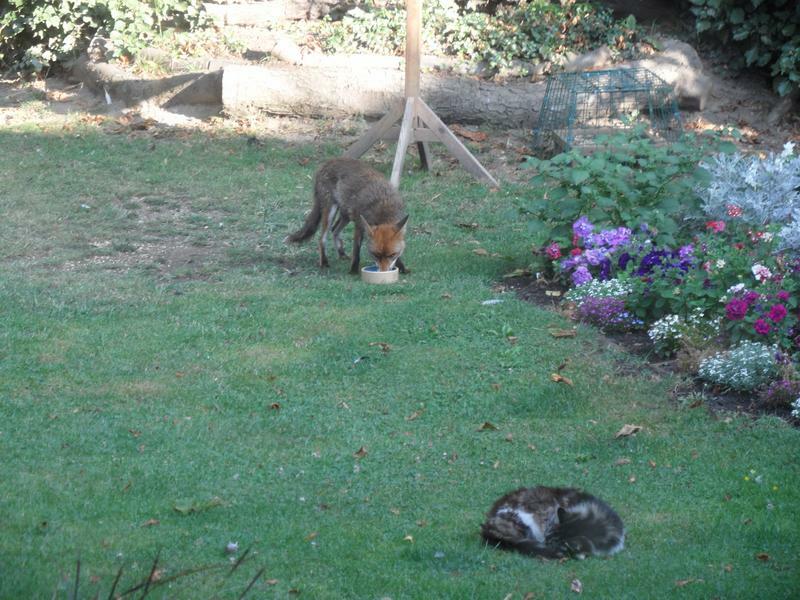 23rd July 2014, Suzy the cat decides to eat the foxes dinner, which does not please the foxes very much. 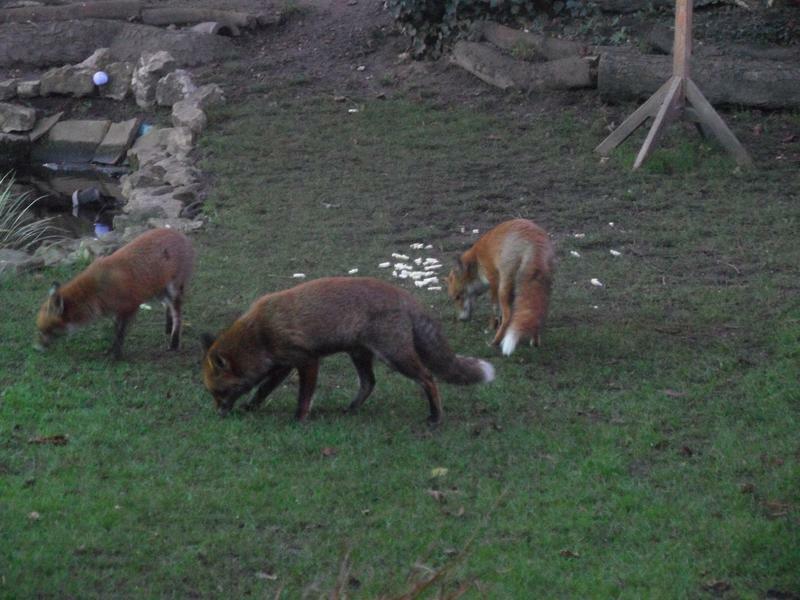 The foxes circle around, but keep their distance, until Suzy has eaten. 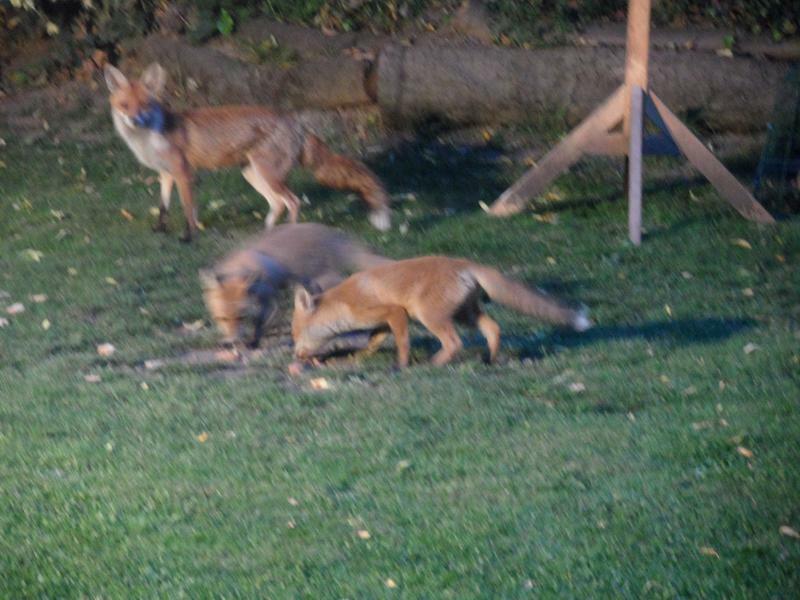 And one of the cubs gets dinner. 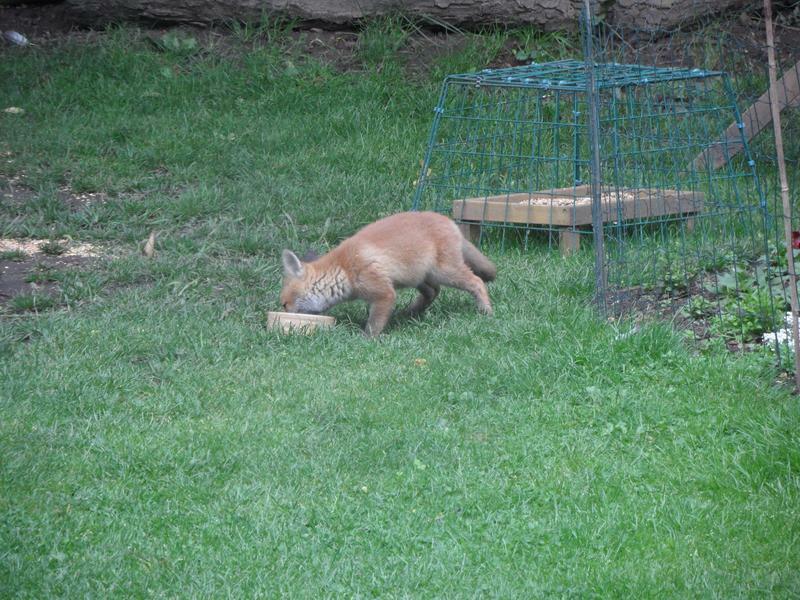 28th July 2014, the cub must be hungry tonight, eating bread left for the birds. 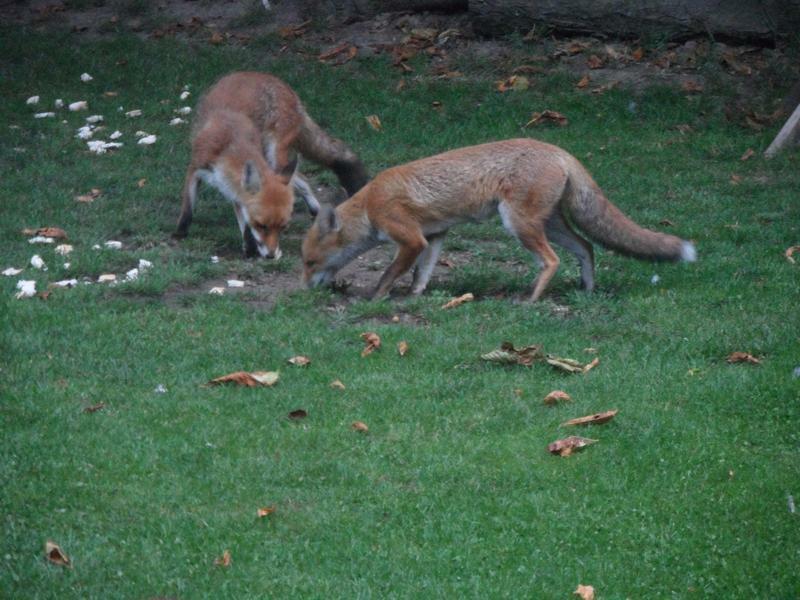 7th August 2014, white tailed fox having breakfast, ignoring Suzy. 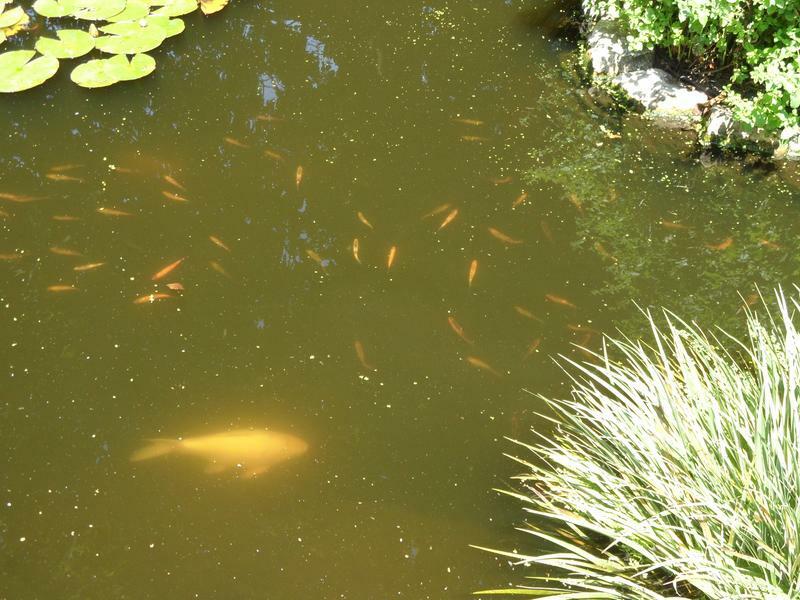 July 2014, a shoal of comets, with a large carp, some are a year old, some two years. 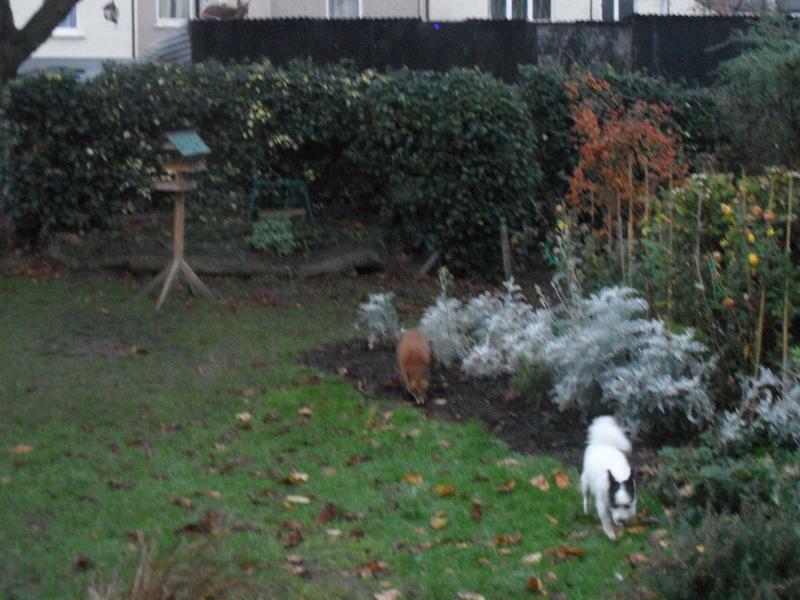 This year's are too small to photograph. 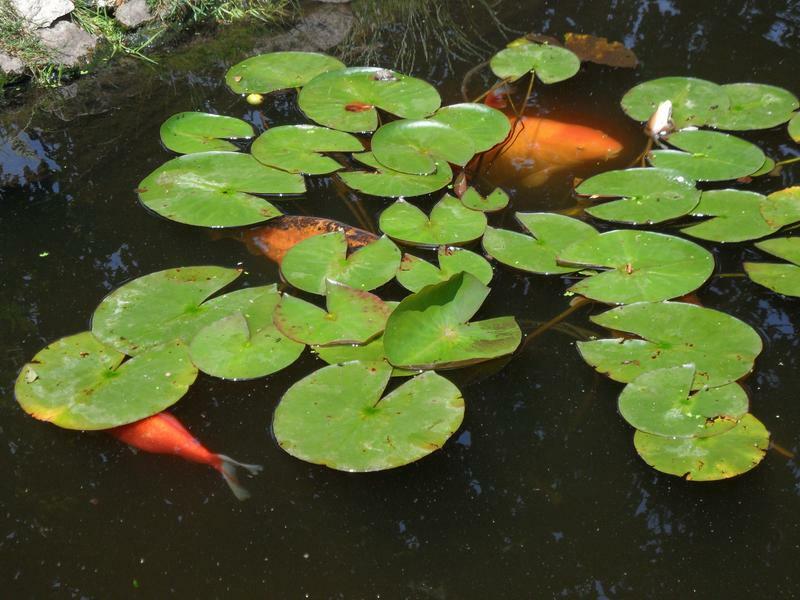 More koi carp hiding underneath the lilies, where the sun is heating the water. 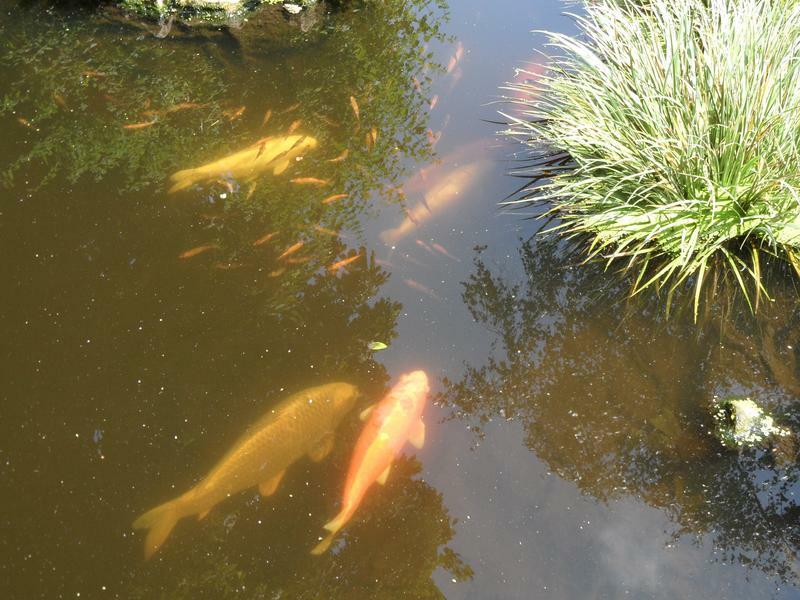 Koi carp and comets swimming around. 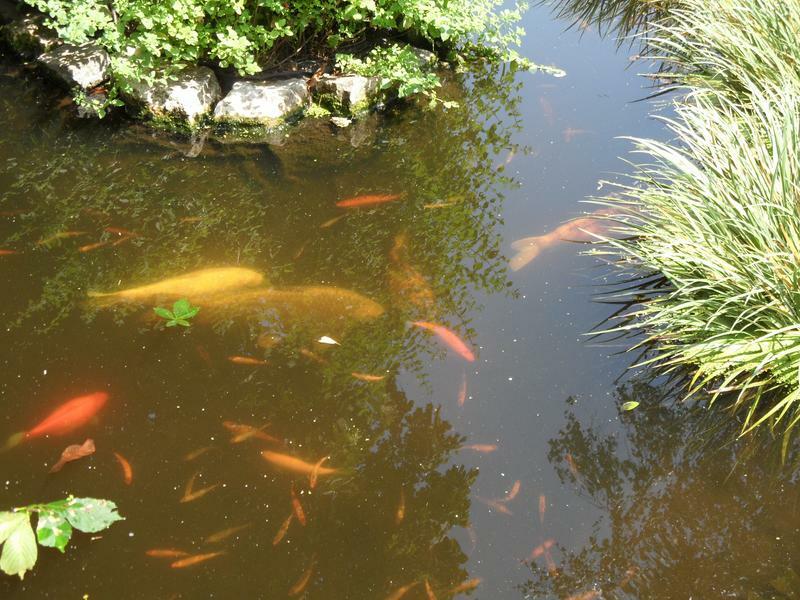 And again, the warmer the water, the more active they get. 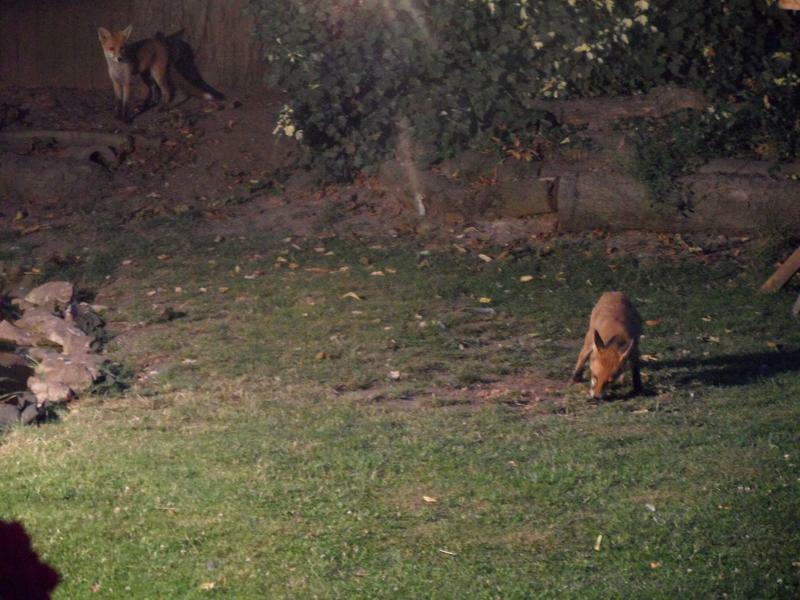 19th August 2014, mother waiting for dinner at 8:30pm. 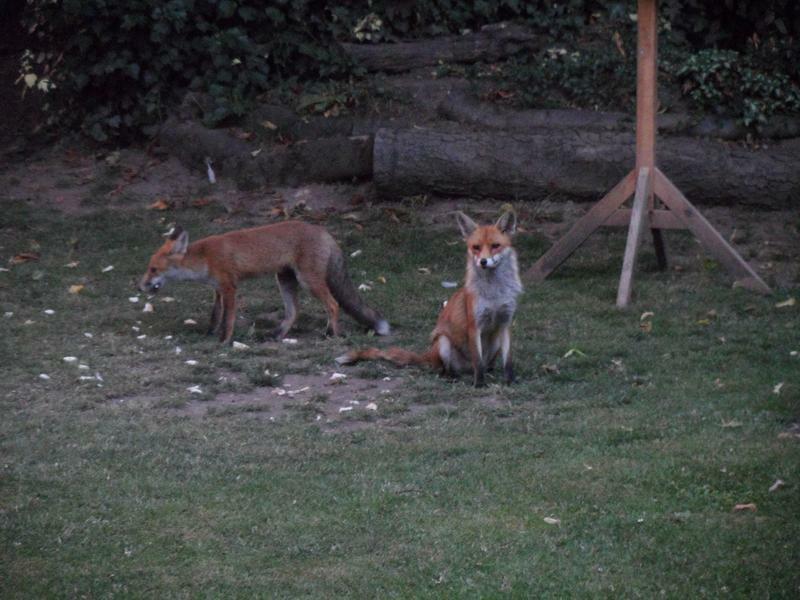 26th August 2014, grandmother (while tailed) and mother together. 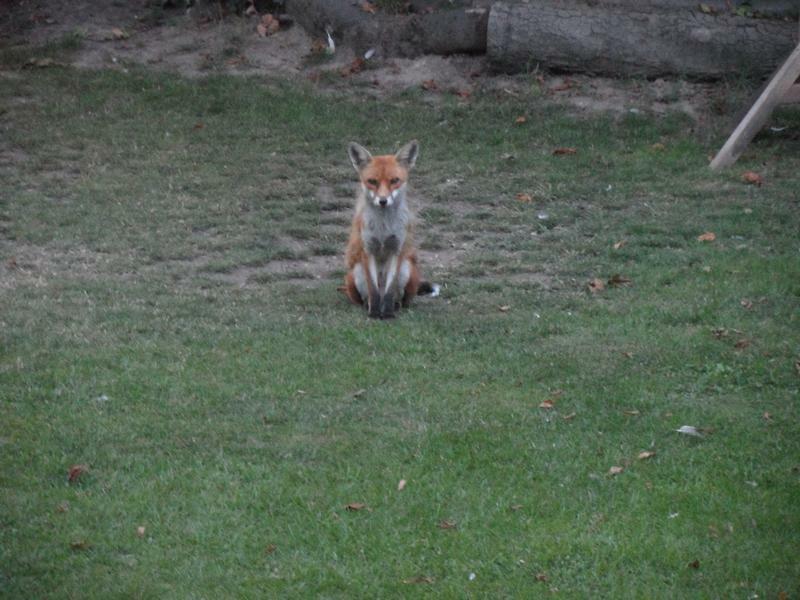 31st August 2014, white tailed fox waiting for breakfast. 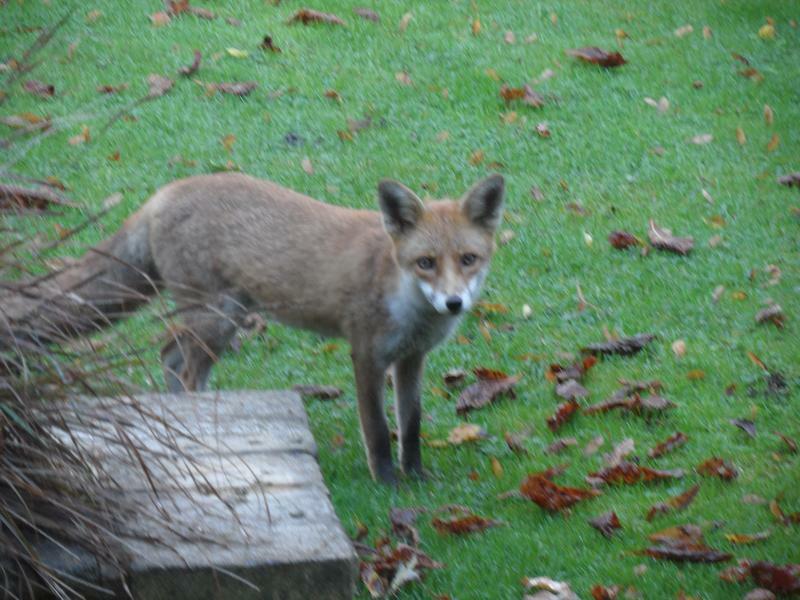 1st September 2014, a rare morning visit from one of the cabs, must have been hungry. 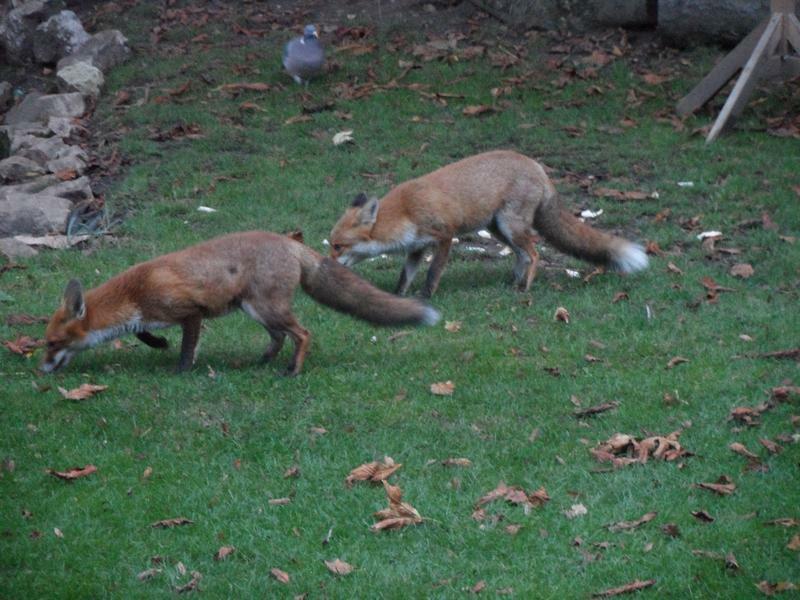 Same evening, two cabs having dinner. 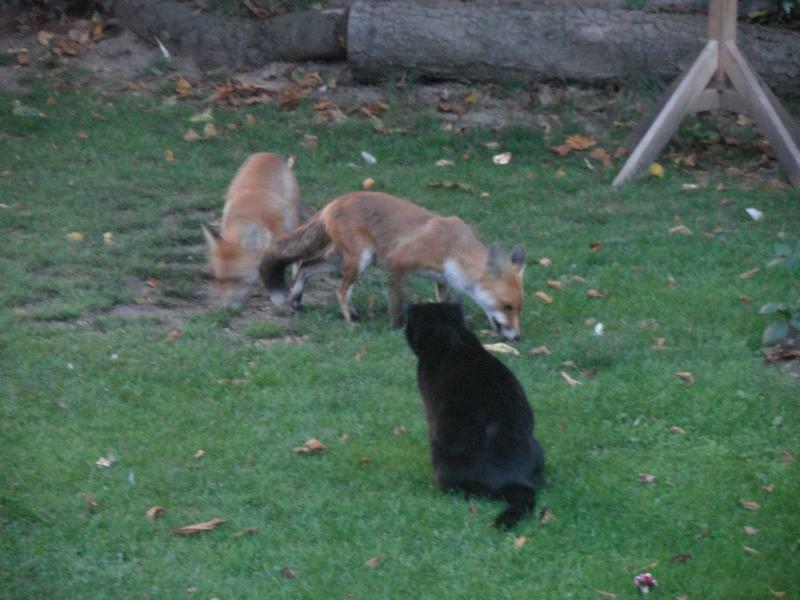 Two days later, one of my cats watches the cubs having dinner. 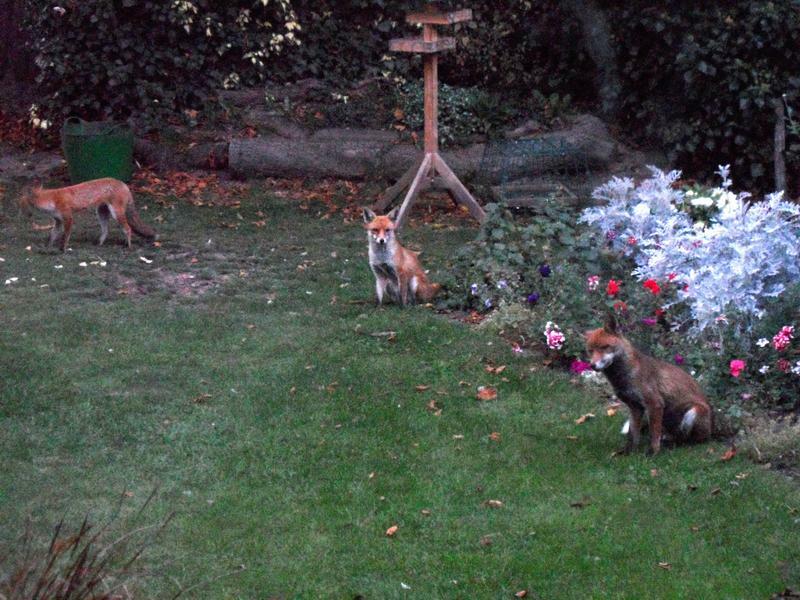 17th September 2014, grandmother and two cubs waiting for dinner. 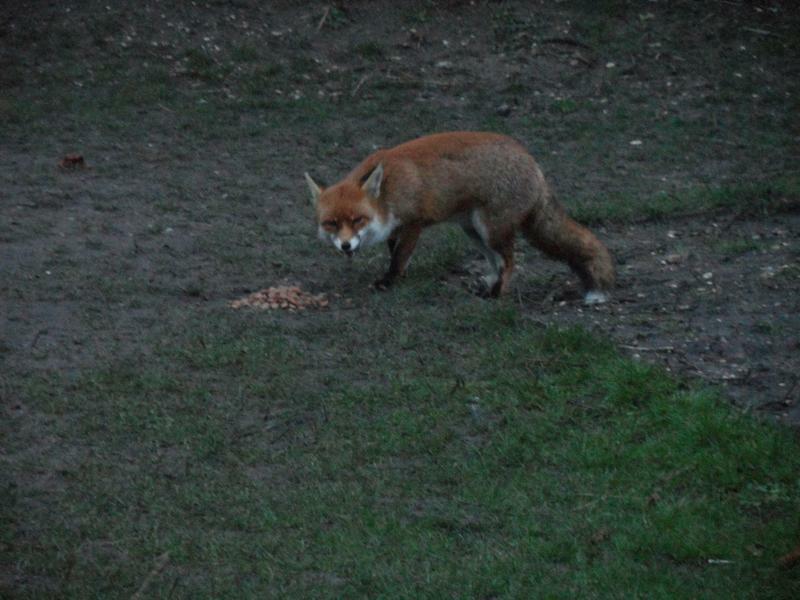 fed since she comes for breakfast most mornings as well. 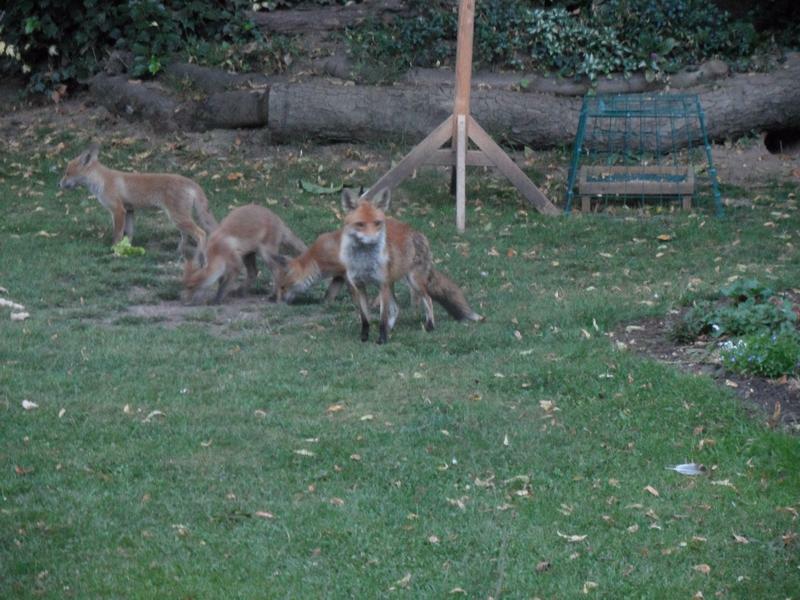 But not every evening. 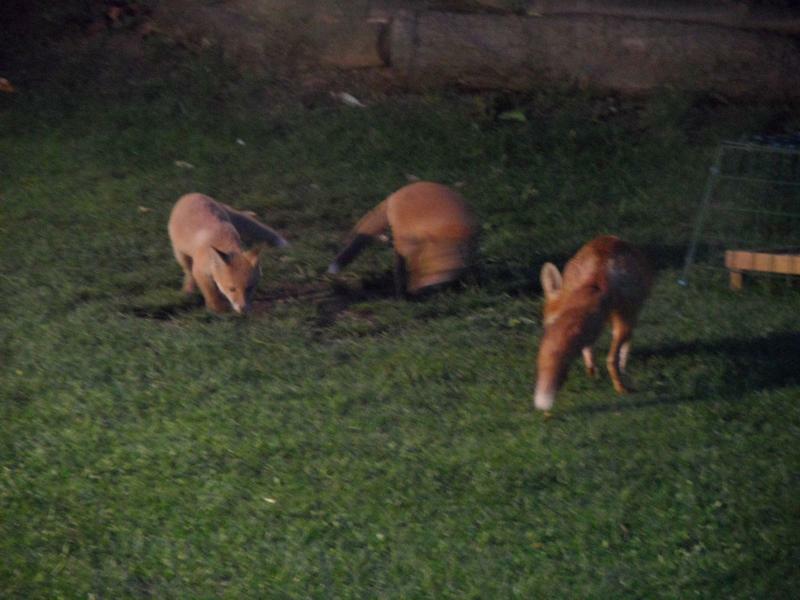 three were here, for one has died. 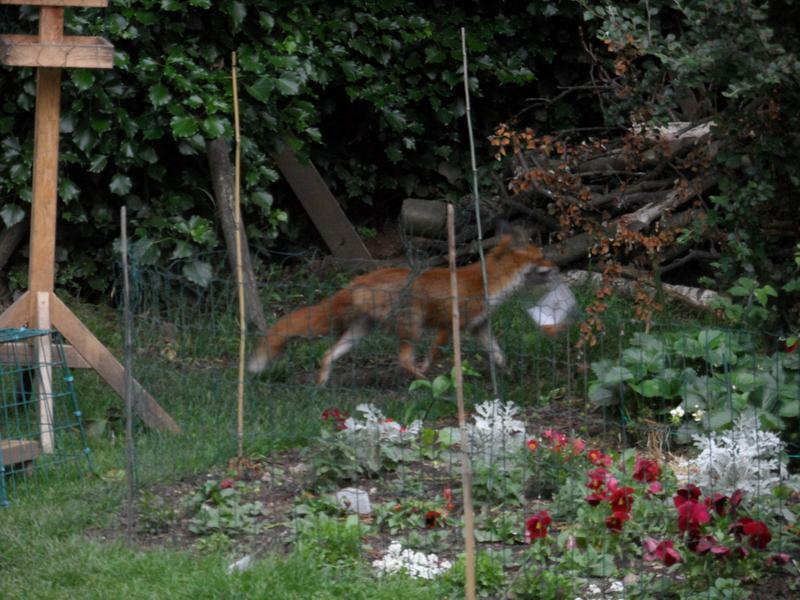 A little later and mother comes for food as well. 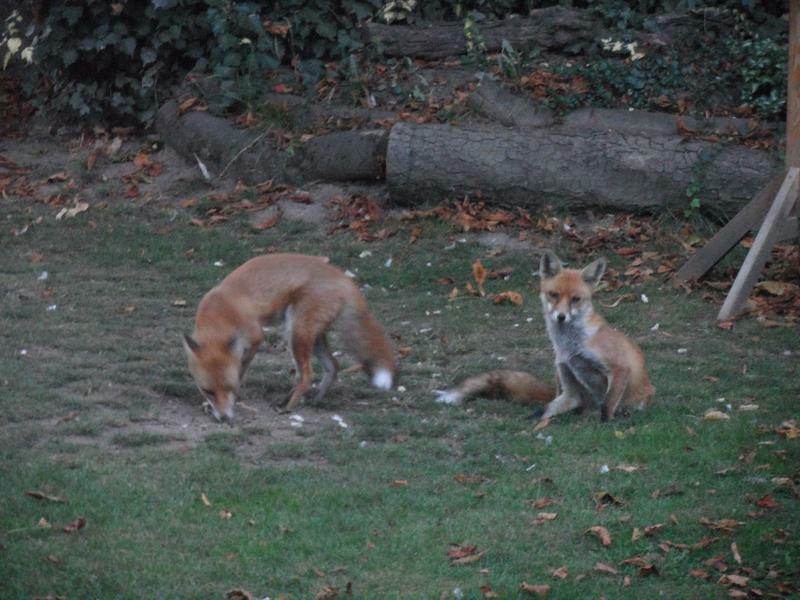 5th October 2014, both mothers waiting for dinner at 6:30pm. 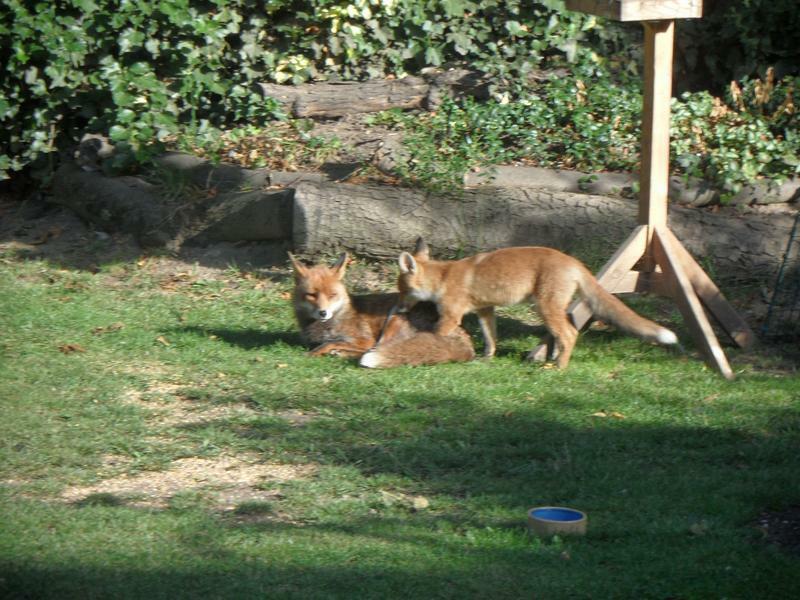 Two cubs and mother again. 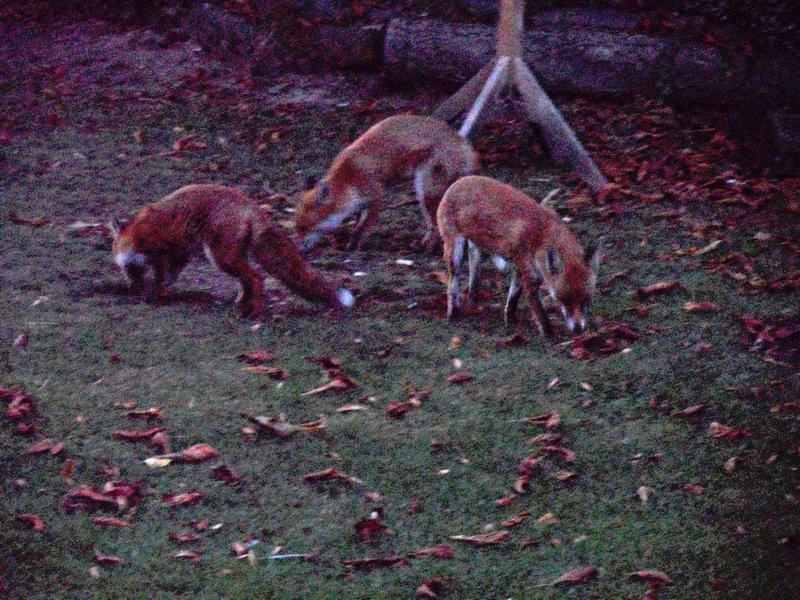 8th October 2014, very hard to tell the cubs apart from mother now, just slightly lighter colour. 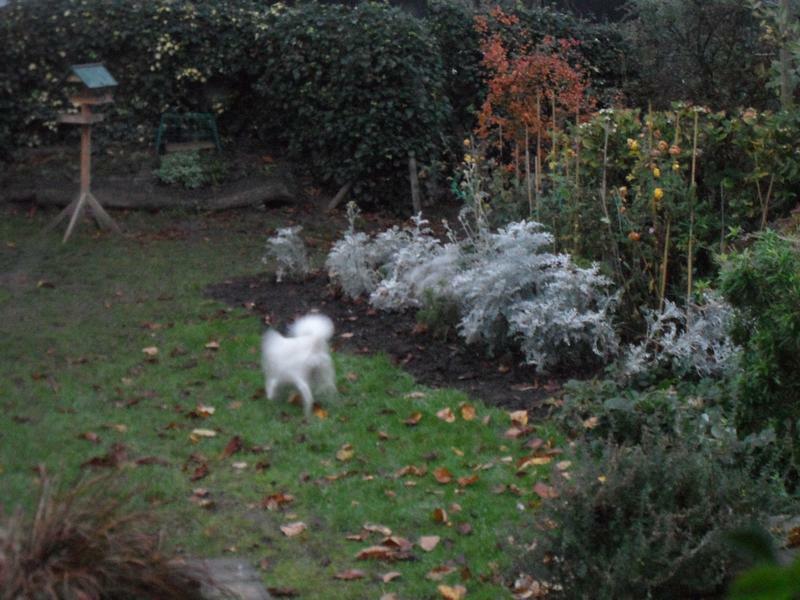 daylight more often, here waiting for a squirrel. 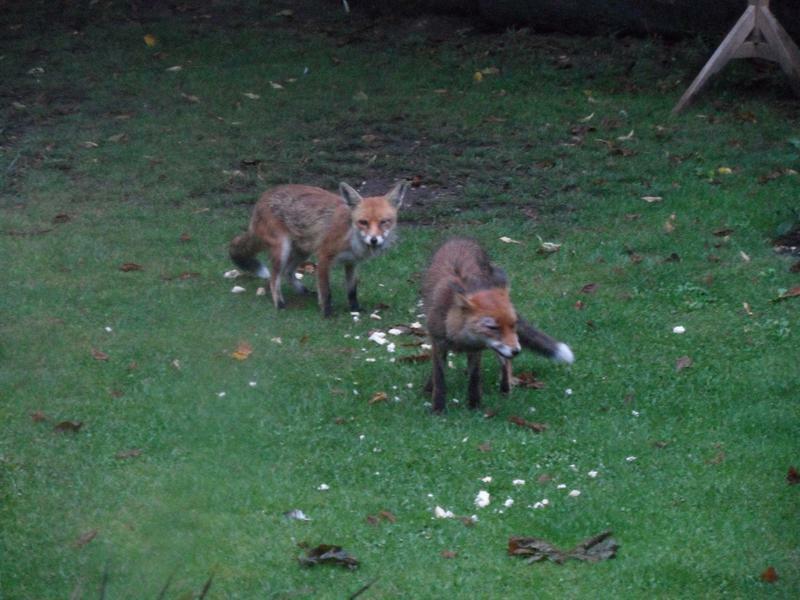 16th October 2014, very rare that a cub comes for breakfast with white tailed (grandmother). 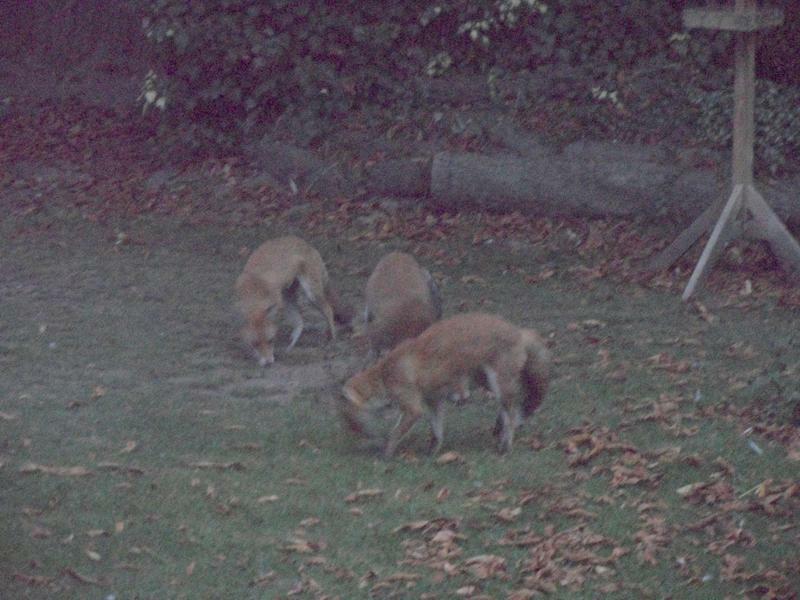 evenings all four foxes are already eating before I've even got back into the house, but only when it's too dark to take photos. 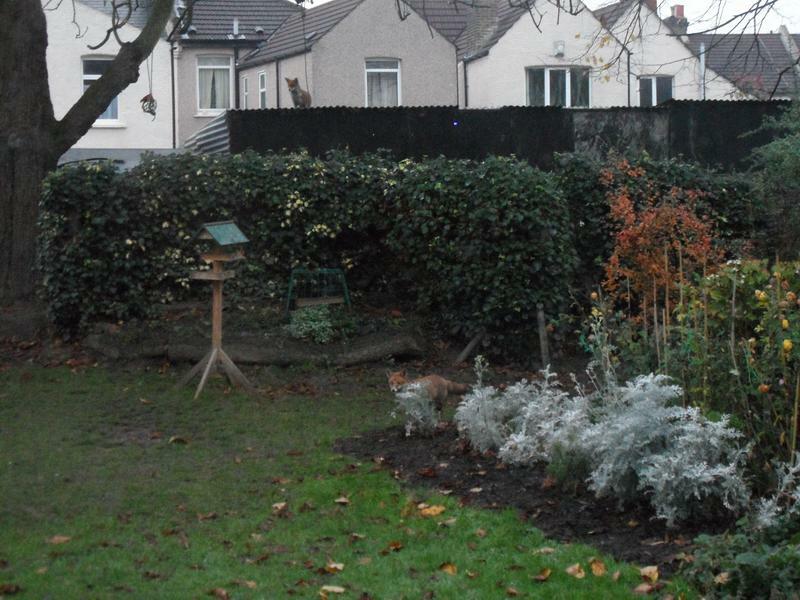 20th October 2014, grand mother and a cub waiting for breakfast at 8:30am. 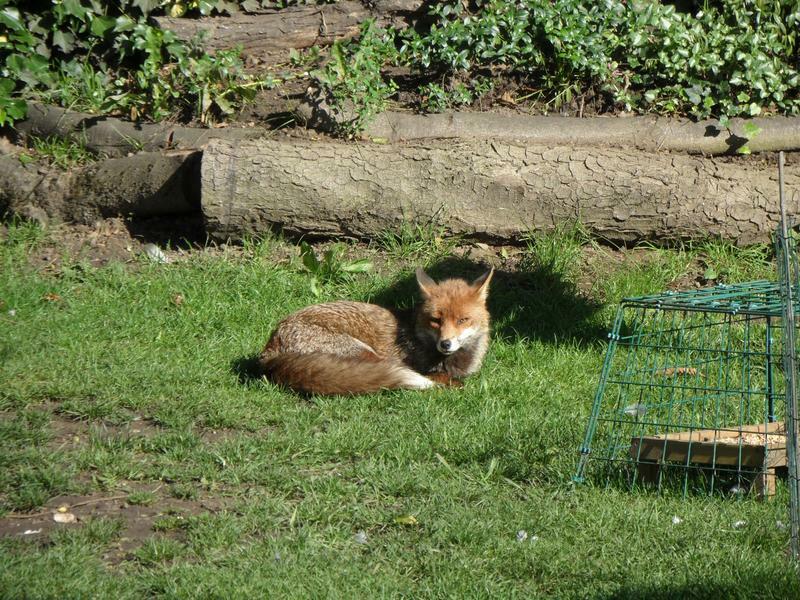 A well fed fox cub. 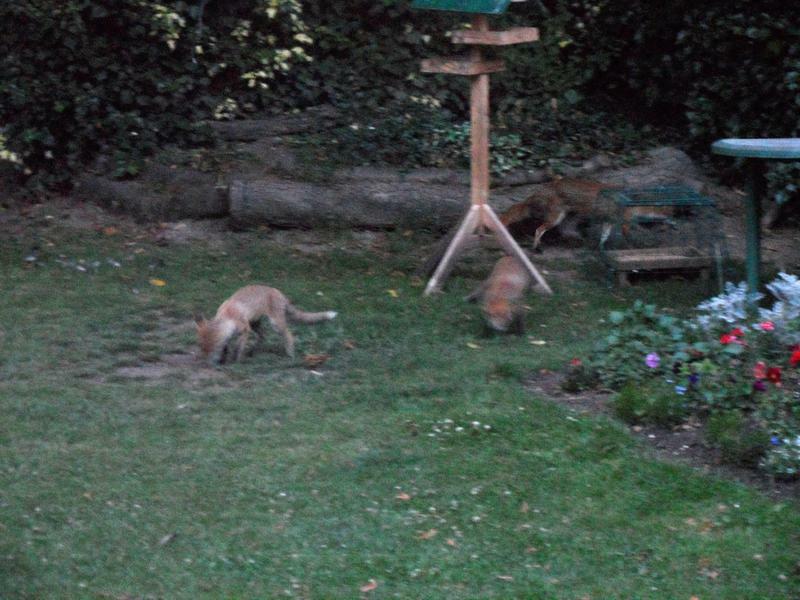 6pm, mother and the cubs having dinner. 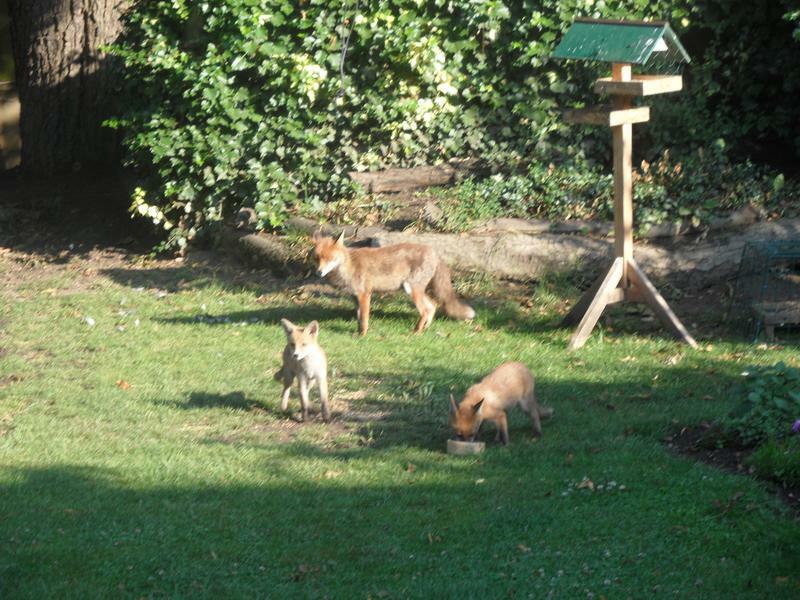 31st October 2014, eating breakfast. 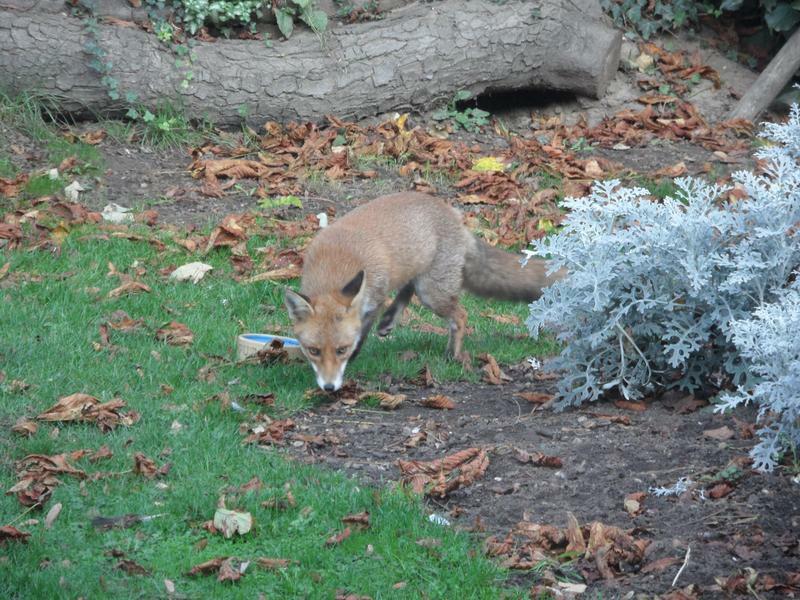 15th November 2014, 9:50am, the fox would have eaten breakfast earlier, but is waiting patiently for more. 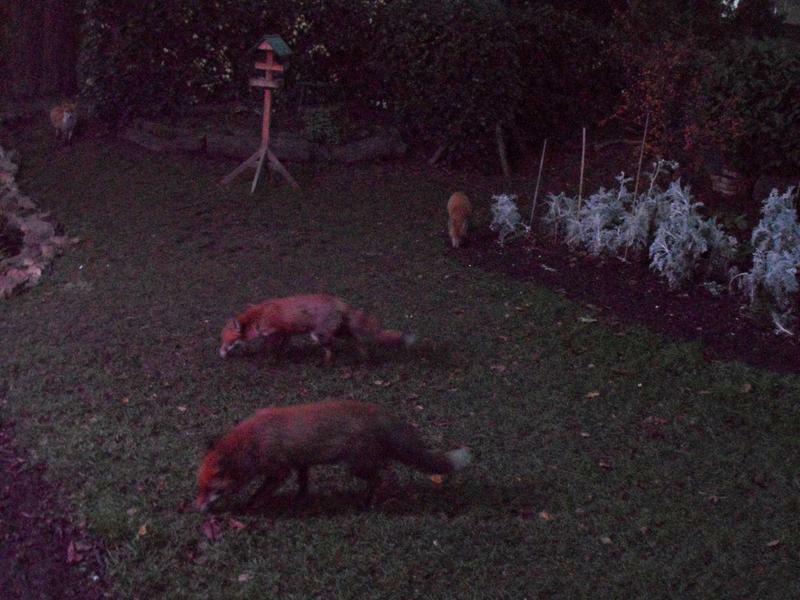 20th November 2014, the mothers and a cub having dinner at 6pm. 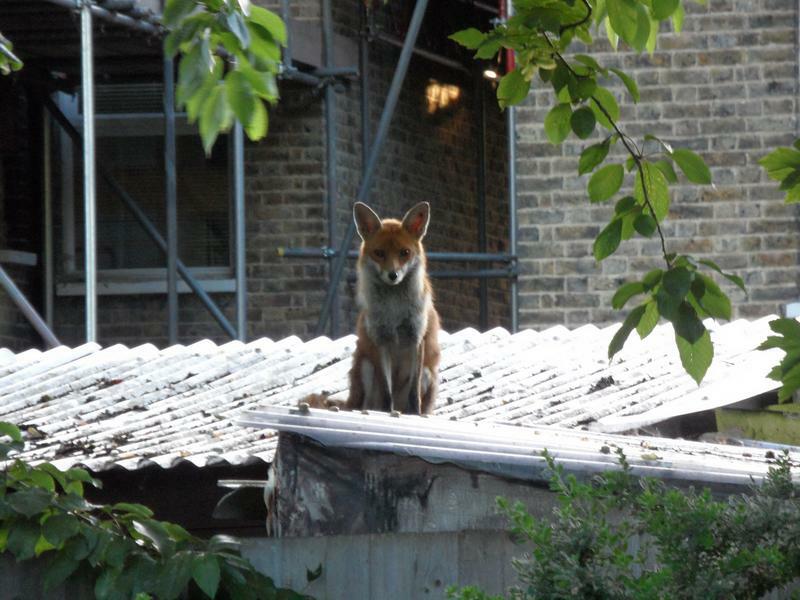 roof, the other by the trellis, behind which Lucy chases the cub. 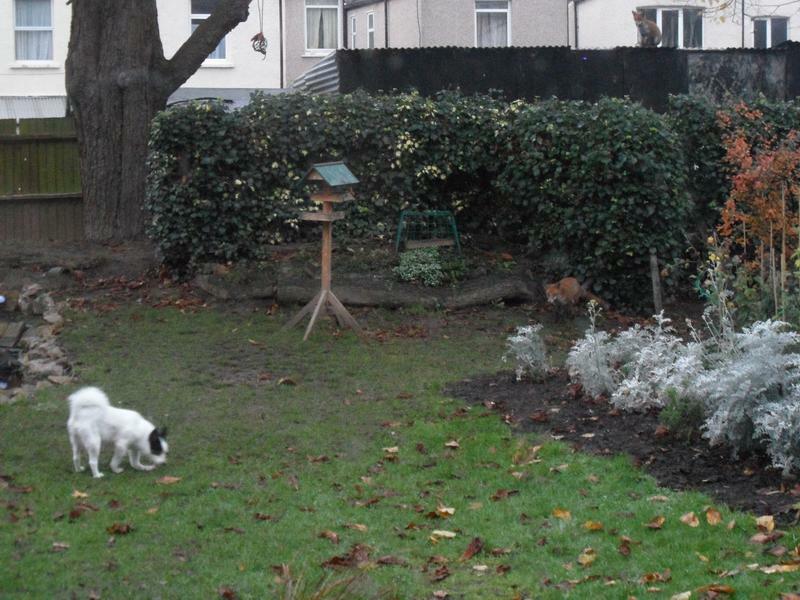 Lucy is sniffing the grass for food. 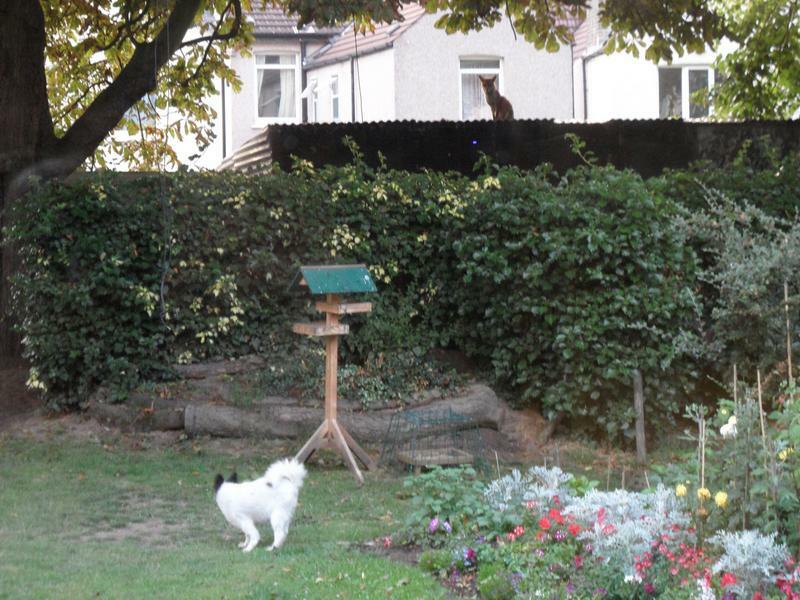 One cub still on the shed roof, the other is stalking Lucy down the lawn. 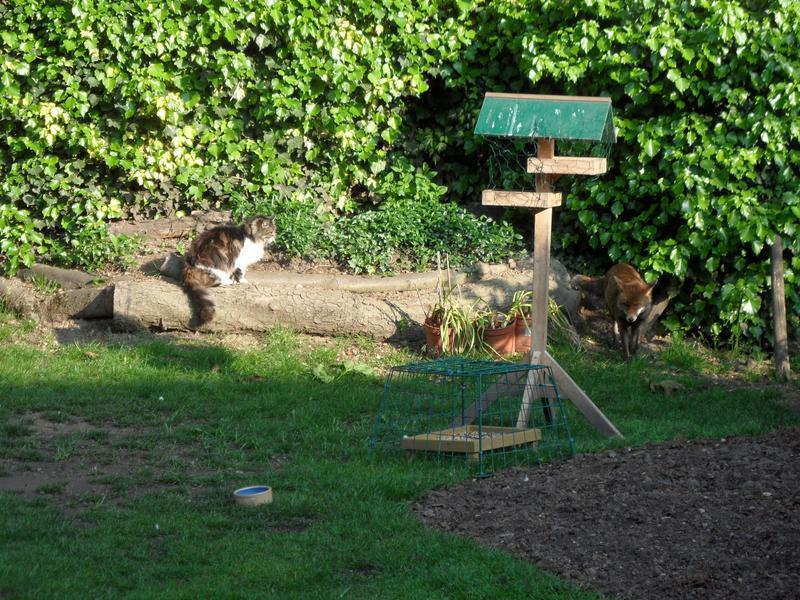 Until Lucy notices and chases the cub away. 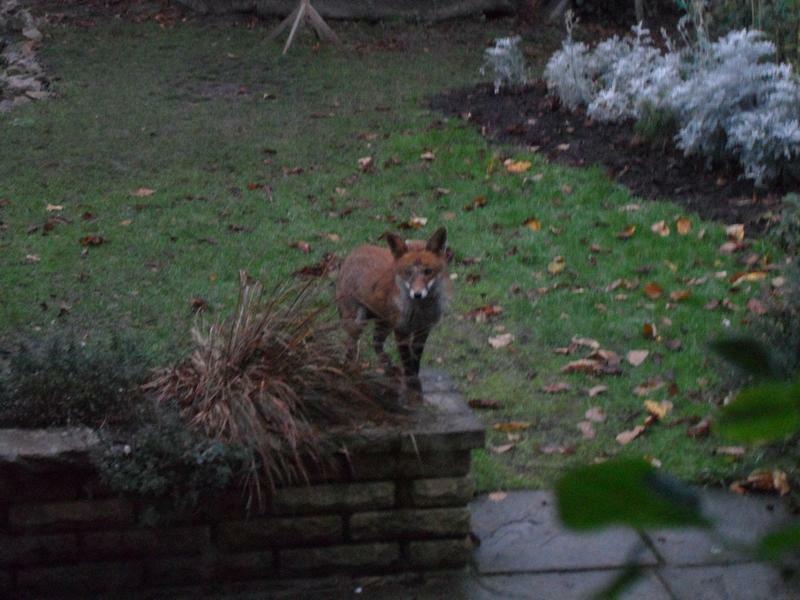 But not for long, the cub is back again. 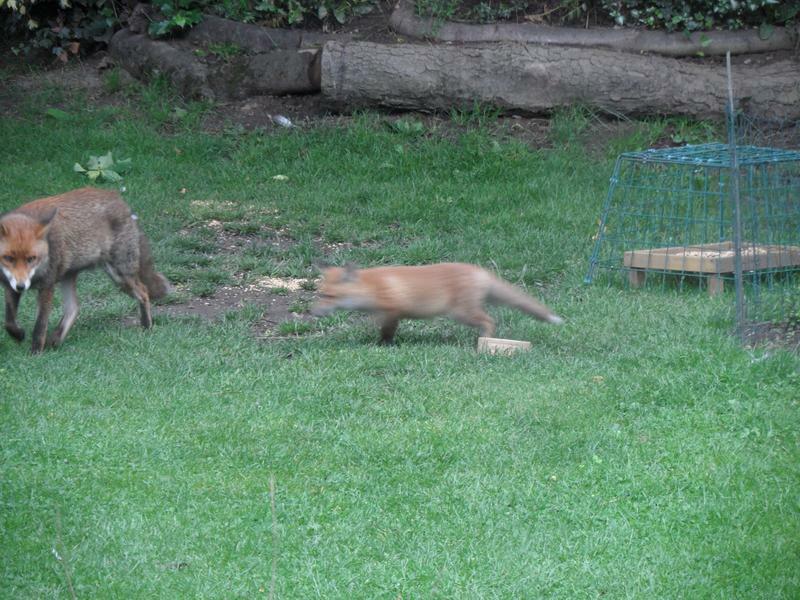 Not for long, Lucy chases the cub again. 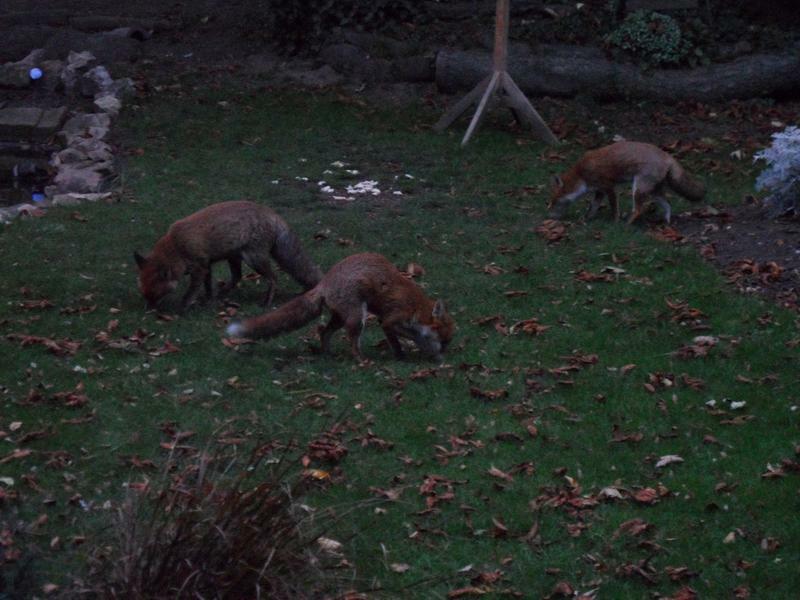 afternoons, although usually when it's too dark for good photos. 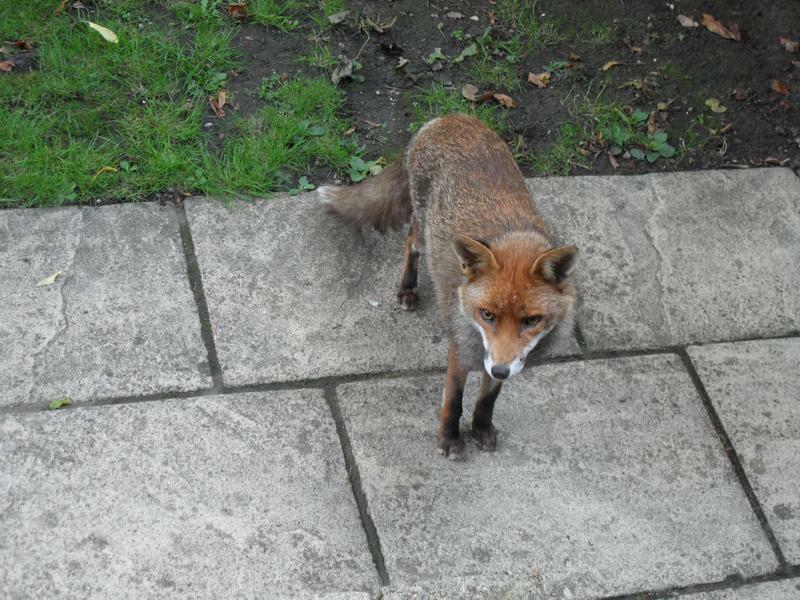 The cub is now standing on the patio wall, begging for more food. 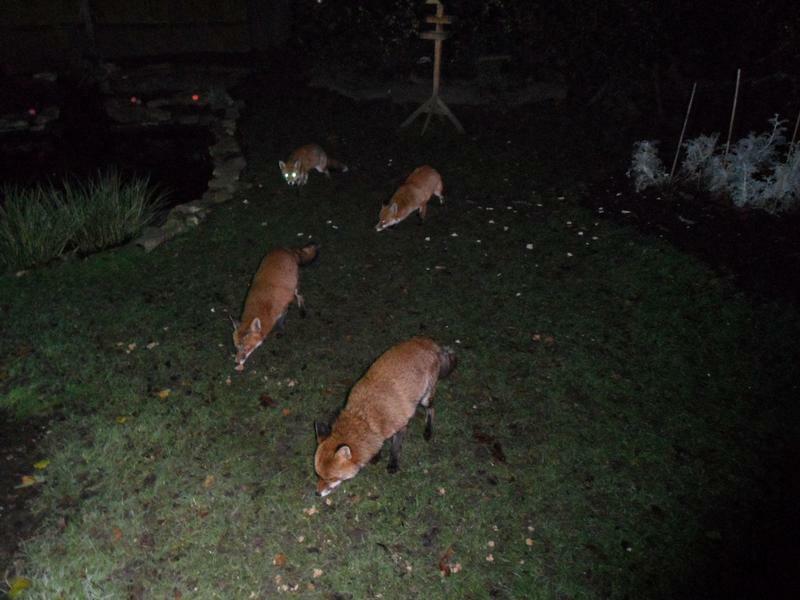 weak camera flash which only really lights their eyes. 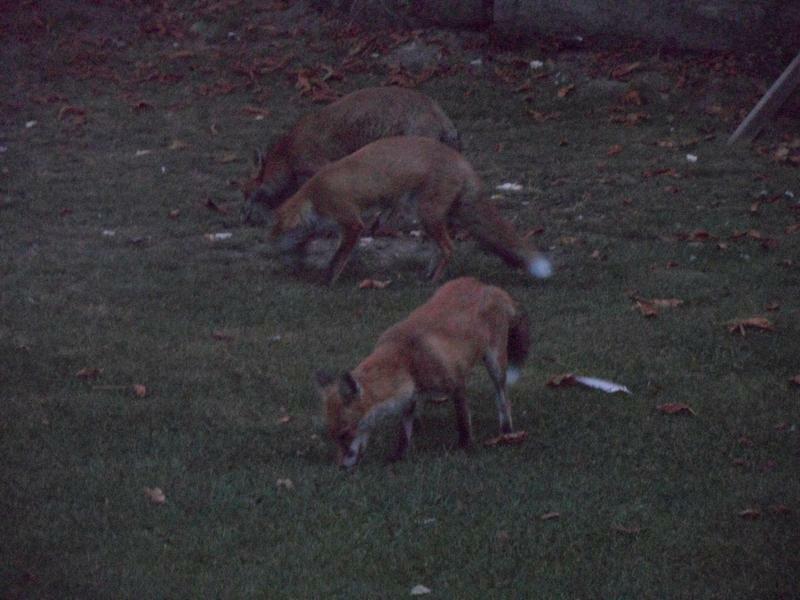 from the lawn. 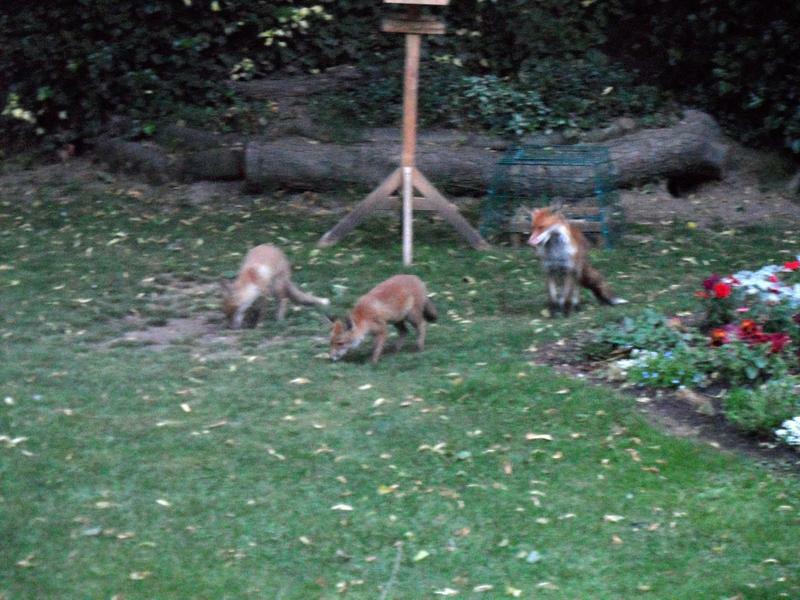 I may have been wrong about three cubs in the summer, or perhaps one died. 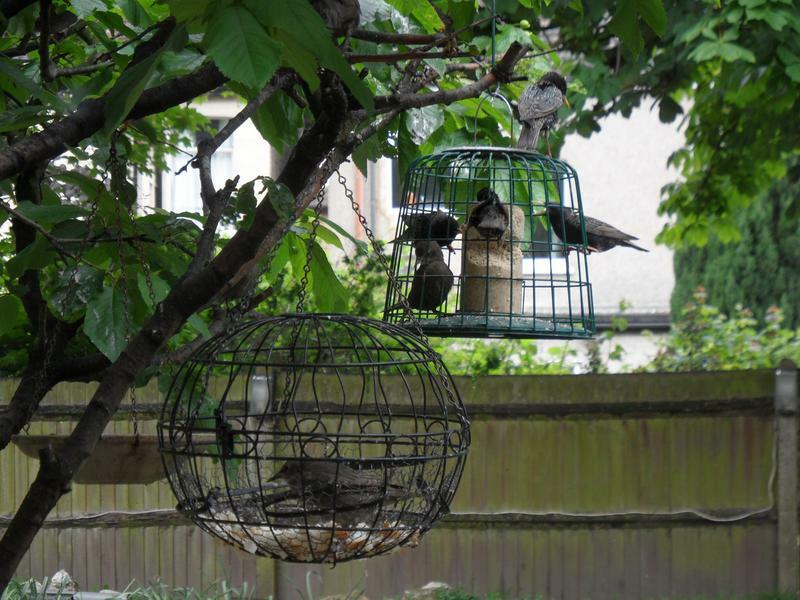 for photography, but perfect to watch them eating. 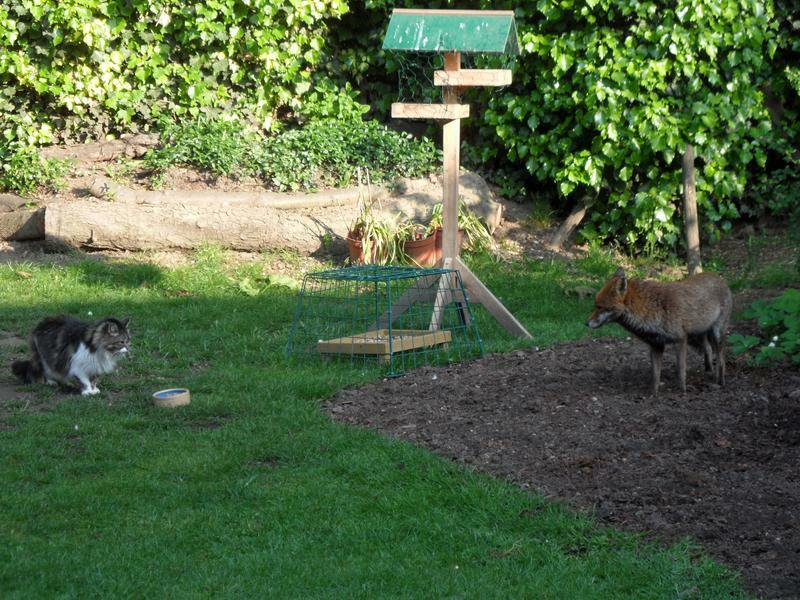 The foxes ignore Suzy the cat, too busy eating. 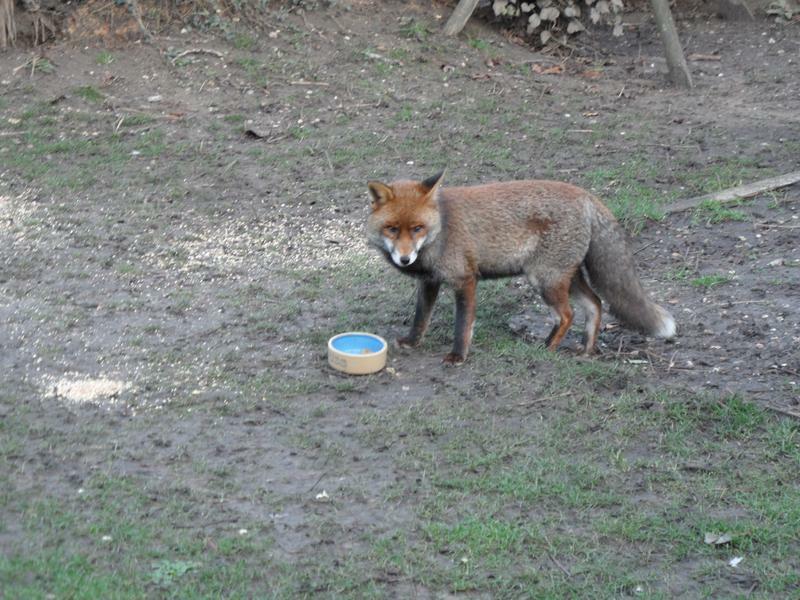 But Suzy decides that dog food is not for dinner. 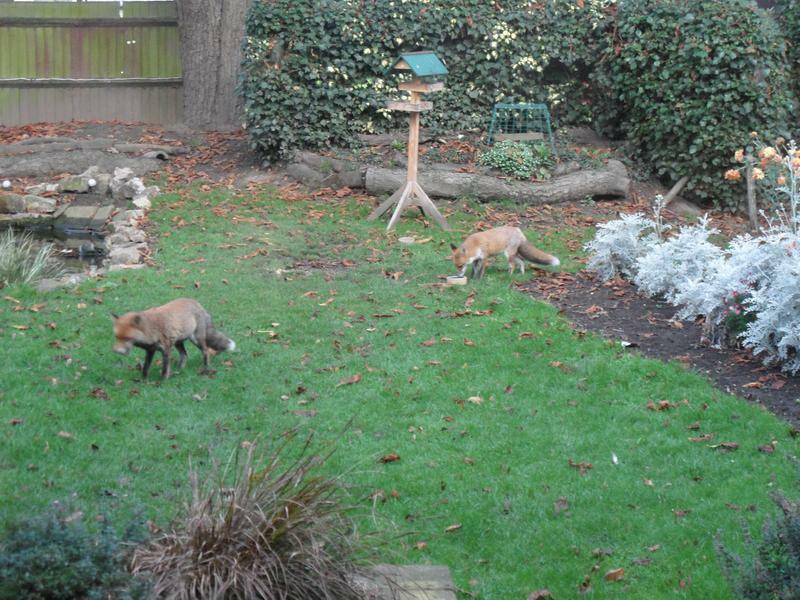 The food has all gone, two watch waiting for more, two scavenge for scraps. 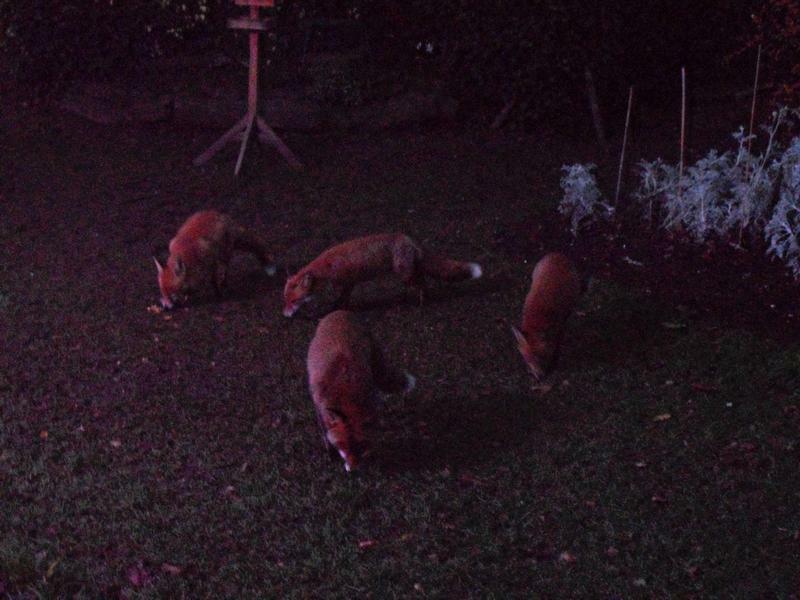 And all four get a second meal, another flash photo. 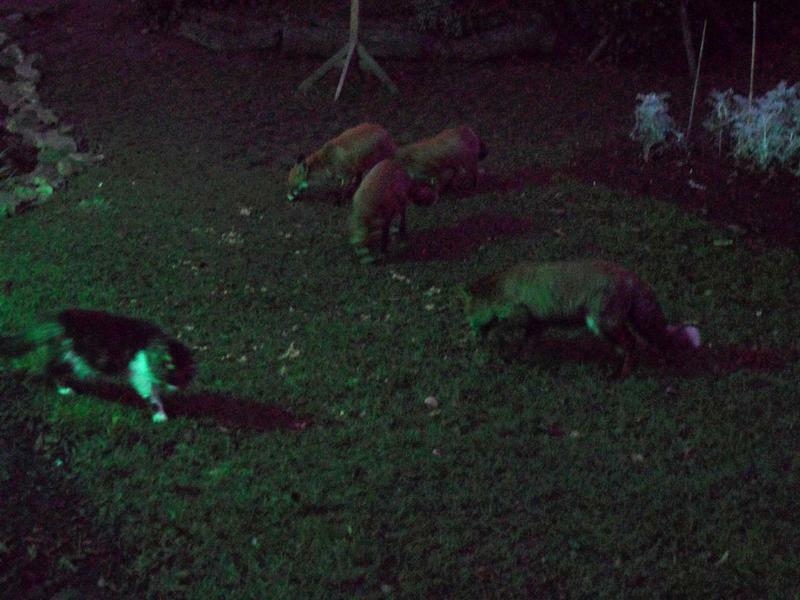 19th December 2014, 5:30, still bright enough for normal photography, both mothers and a cub. 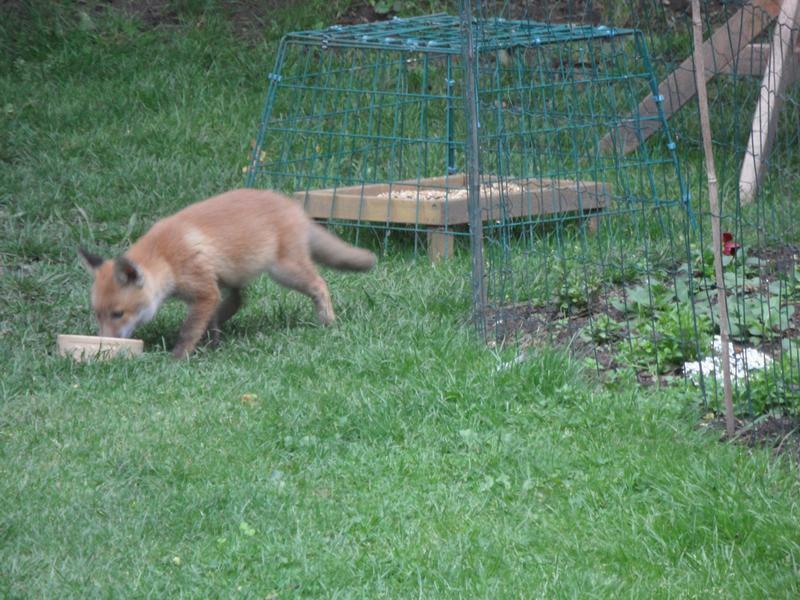 The second cub is more timid.